and so, while some results are less good, e.g. estimate of eta-Earth (number of habitable zone planets per star) and the masses of low-mass planets, Kepler’s place in history is assured. To me though, Kepler’s greatest result is really the ubiquity of exoplanets; specifically small planets. Almost as impressive has been Kepler’s contribution to the proving of stellar asteroseismology. Whilst these techniques had been applied to the Sun and individual stars, Kepler has been used to derive stellar parameters for hundreds of stars at a level never before achieved en masse. 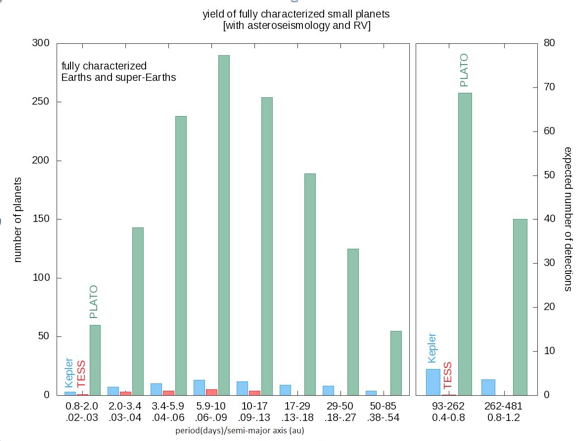 Kepler has given us a tantalizing first glimpse of the small/rocky planet population and some of the results have been absolutely awesome (Figure 1). For example, masses for the fantastic seven planet Kepler-11 system have been derived through modelling the gravitational perturbations giving rise to the transit time variations, and show these planets are much bigger than expected for their masses—maybe they are mini gas planets or have fluffy extended atmospheres. Figure 1. The known small planet population in the mass-radius plane (x-axis’ units are Earth masses) compared to different compositions and compared to rocky planets in our solar system There is far more diversity than originally expected. At the other extreme is Kepler-10c. Kepler-10b (mass 3.33ME, radius 1.47RE, Period 0.84d) was well known as Kepler’s first rocky planet, and spectroscopic observations from the ground with HARPS-N on La Palma not only confirmed this, but also detected the stellar reflex motion from the long period Kepler-10c component. Surprisingly, the mass turned out to be 17.2ME, but the Kepler (2.3RE) radius suggested we were still most likely looking at a massive super-Earth. Given that we struggle to understand the internal structure of the Earth, we are quite mystified to explain that of Kepler-10c. These results and others lead us to believe the small planet population is much more diverse than we originally believed. When Kepler was being designed, it was generally agreed that there would be little variation of compositions in this population, so that from a measurement of planetary radius its mass could be directly inferred. Consequently, it was assumed that there would be little need for follow up observations. Kepler showed us the need to determine the planetary mass directly. Since the first discovery of a planet around a Sun-like star (Mayor and Queloz 1995), radial velocity surveys—searching for the reflex motion induced in the star—were often the most efficient discovery technique. Compared to the transit method’s strict requirement on the orbital geometry, radial velocity detection is far more lenient. However, without knowledge of the orbital inclination to our line of sight, all we can determine is the planetary minimum mass. Basically, from radial velocity information alone we can learn about the planetary orbit, but essentially nothing about the planet itself. 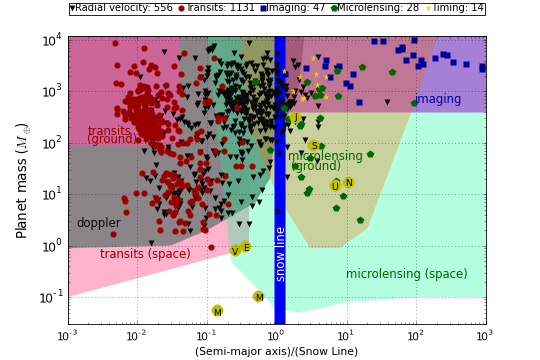 Radial velocity information is most useful when it is used alongside transit data. With radius and, most importantly, orbital information coming from the light curve modelling, solutions of the equations of motion can give an accurate planetary mass. Thus, we can get an accurate estimation of the bulk density/composition of a planet. What should be emphasized here is that to derive the planetary mass and radii requires better accuracy in the stellar parameters; in fact, for the best transit light curves knowledge of the host star is often the factor limiting that of the planetary component. 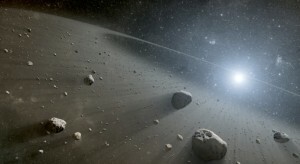 The study of exoplanets has led to a renaissance in stellar research and especially the proving of asteroseismology. The low brightness of the Kepler field stars and the prevalence of small planets is a double whammy for our studies of the masses of small planets—the small reflex motion and lack of stellar photons make mass measurements at best somewhat challenging. So while the Kepler photometry has produced highly accurate relative radii, even the brightest Kepler host stars are challenging targets for radial velocity work. It is ironic that the planets with the most accurate accepted masses are massive planets found from ground-based transit surveys such as SuperWASP or HAT. As a consequence, researchers have developed our ability to model gravitation perturbations detectable through transit timing variations (as noted earlier) and this is how most Kepler planetary masses have been determined. This has the advantage that they can be derived from the light curve alone and with apparently small errors, but is possible for only a small fraction of the planets. There is still some controversy surrounding the use of masses derived in this way and maybe more importantly in the quoted errors. Maybe this will improve in the future. However, one of the big lessons from Kepler (and the ongoing K2 surveys of course) is that we need a host star population as bright as possible so we can derive masses, make planetary atmosphere observations, etc. So given this, what does the future hold? For exploring the inner parts of solar systems, and in particular the habitable zones, for the next 10–15 years it is likely that transits of bright stars that allow radial velocity observations to be made will dominate (Figure 2). That’s not to say that other techniques and regions of the parameter space will not be important—they will. For example, with SPHERE and GPi we are taking our first steps with dedicated and optimized instruments capable of direct planet detection—at least of luminous, young and massive planets. JWST may also be capable of this. Gaia and various microlensing space missions such as WFIRST (~2025) or EUCLID (2021) will allow us to statistically explore the outer parts of solar systems. Figure 2. The funded transit roadmap showing facilities that are used for detection and bulk characterisation. Some of the facilities here can also be used for atmospheric characterisation. In terms of transit experiments, we have a crop of ground-based experiments—including the new NGTS, and the re-tasked Kepler K2 surveys. While still at an early stage, NGTS is proving capable of routinely detecting dips which could be due to Neptune-sized objects. Various experiments have been deployed targeting M dwarf stars, where the low intrinsic brightness and small star size mean that ground based photometry would even be capable of detecting Earth-sized planets in orbits of a few days; corresponding to the habitable zones of the feeblest stars. In general, finding small planets (smaller than Neptune, say) in habitable zones is a difficult task and is best done from space. This not only avoids limitations in photometric accuracy from the Earth’s atmosphere, but also the interruptions caused by the day/night cycles. Even still, as we push to higher and higher accuracies stellar activity becomes a bigger issue with less stars being suitable for radial velocity work. 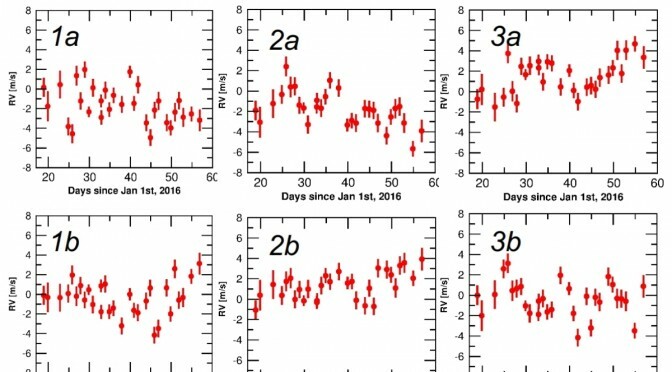 However, understanding stellar activity is an area of much research and there is hope that small radial velocity signals will be detectable against the activity signal in the future. Nonetheless, we are fortunate that both NASA and ESA have recognized the need for new surveys and we have a series of missions that have transit detection at their heart. 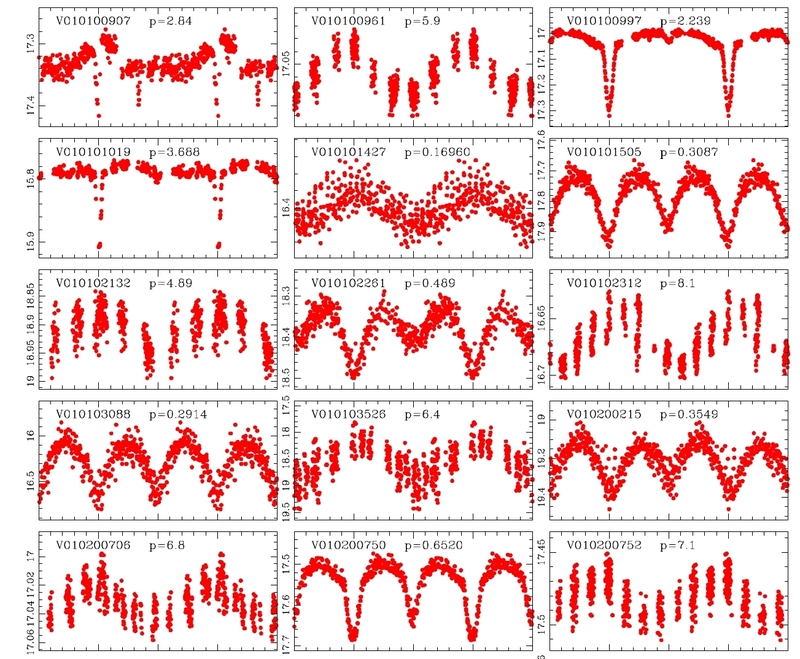 High accuracy light curves of transits from other surveys, notably NGTS. So, while CHEOPS is not a survey instrument it will produce extremely accurate photometry of known planets and hence bulk densities. CHEOPS also has many other potential uses such as monitoring transits for timing variations etc. NASA’s Transiting exoplanet Survey Satellite, TESS, will be launched around the end of 2017. TESS will be orientated into a highly eccentric and inclined orbit which reaches almost to the lunar orbit. For most of the 27 day orbit the satellite will be far from the Earth, enabling accurate photometry. The clever orbit and observation strategy results in sections of the sky being monitored for 27 days before moving to the next section. These sections overlap at the Ecliptic poles and so a small region is monitored for as long as ~1 year. Given this, it is likely that TESS will find many single transiting systems which would benefit from CHEOPS observations. TESS is aimed at surveying the nearest and brightest stars (mag) and is therefore preferentially examining M dwarfs. These low luminosity stars have habitable zones close in (periods as short as a week or so for the coolest objects). Furthermore, as these stars are quite small the detection of small planets can be achieved easier. Being extremely red objects they are likely to be ideal targets for the JWST and it is likely that the first observations of the atmosphere of a habitable zone planet will come from TESS. Over the years, there has been a succession of transit survey concepts studied by ESA, but in 2014, PLATO was finally selected as the “Medium 3” mission with launch date in 2024. PLATO was designed from the outset to characterize habitable zone rocky planets with Sun-like host stars that are bright enough for observation with the new generation of radial velocity spectrograph’s such as ESPRESSO at ESO’s Very Large Telescope (VLT) in Chile. PLATO is a multi-telescope system which provides a huge field of view (>2,200 square degrees—about 20 times that of Kepler) with excellent sensitivity and it will be stationed in a thermally stable environment at the L2 point, several million kilometers from Earth. While the dynamic range is from 4–13 magnitude, most of the interesting science will be for stars with magnitudes allowing asteroseismic characterization of accurate stellar parameters including their age. Figure 3 shows the predicted rocky planet catch for stars that can be fully characterized through asteroseismology compared to those from Kepler and TESS. The time requirement for the ground-based follow up will be almost entirely driven by the smallest, longest period, planets and will represent a significant investment by the astronomical community. 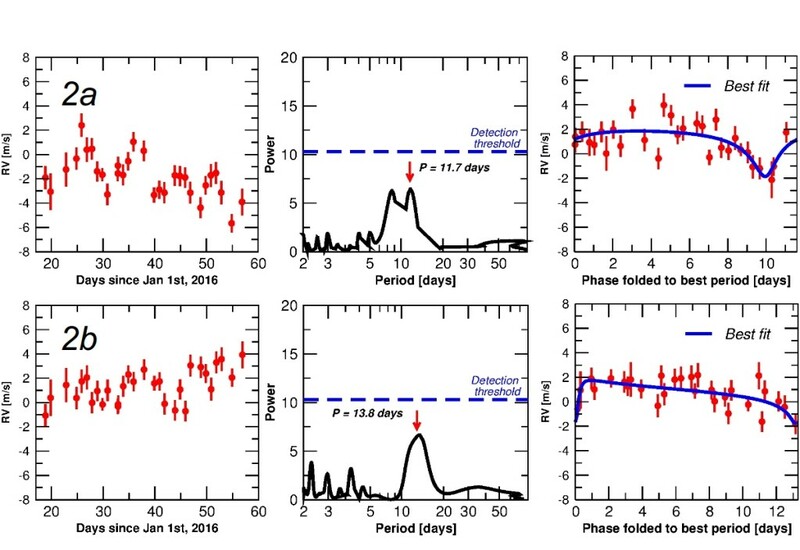 For some of the multi-planet systems, masses will also be available from models of any transit timing variations. While PLATO will certainly produce lots of interesting and no doubt unique systems and maybe even moons, rings, etc., the real PLATO reward will be the database of uniformly characterized planetary systems that can be used for future theoretical and observational experiments. By the end of the next decade, we will have fully characterized hundreds of systems containing rocky planets. Many of these will be bright enough to have their atmospheres examined with the instruments of the day. The database of PLATO systems with known ages will allow us to take the first steps in comparing the observed planet population with theoretical studies, hence throwing light on the important processes that are sculpting the architectures of these systems. 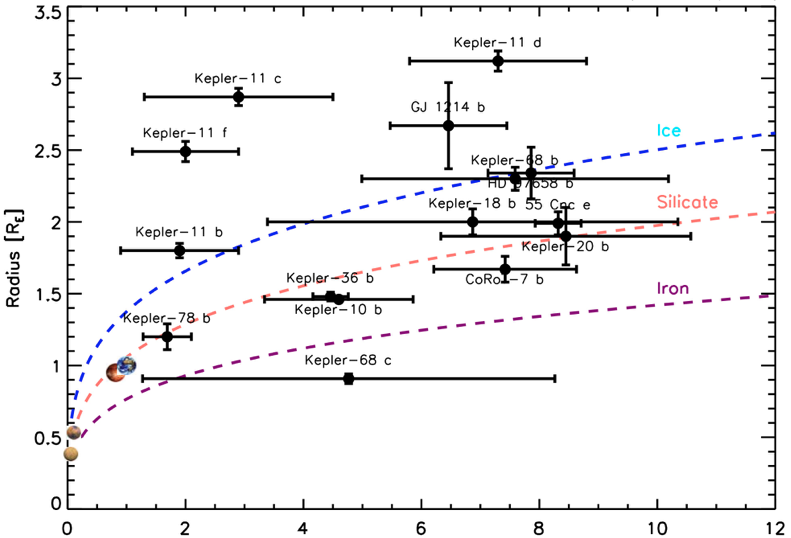 In many ways PLATO can be considered the descendant of Kepler and indeed one of the options for PLATO is to revisit the Kepler field to examine the variations in transit timing variations accumulated after a delay of some 15 years. We live at a very fortunate time. Kepler has opened the window and shown us some of the landscape. The new missions will enable us to make great gains in comparative planetology so that we can understand our place in the Universe. About the author. 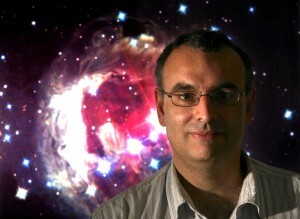 Don Pollaco is a Professor of Astronomy at Warwick University, UK. He was awarded his PhD in 1990 from St Andrews University. 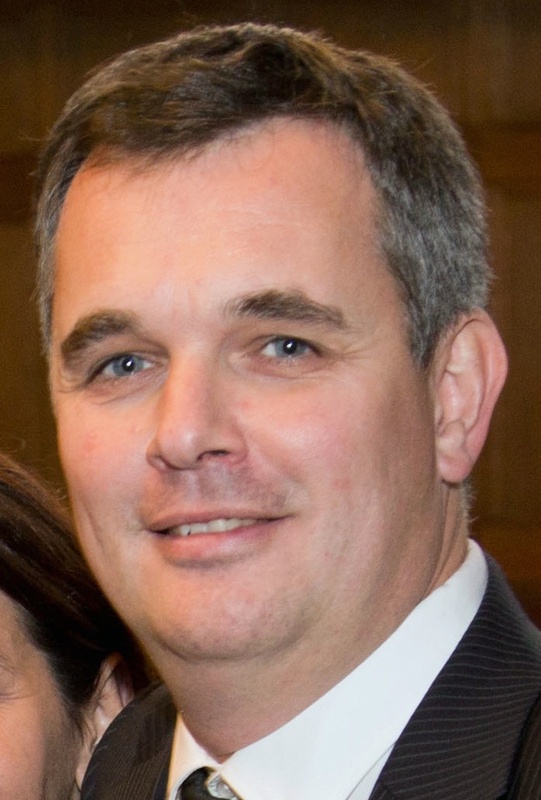 From 1990–1995 he worked as a PDRA and then lecturer at St Andrews and Liverpool John Moores Universities. Between 1995-2000 he was based at the Isaac Newton Group of Telescopes (ING) La Palma. His PhD and postdoctoral studies were concerned with evolved stars and binary systems. 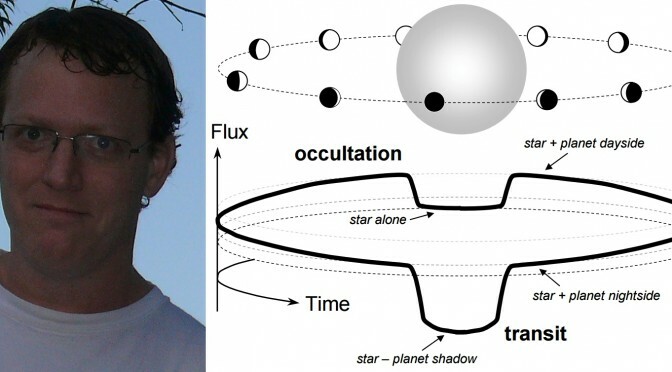 From 2000–2012 he worked at Queens University Belfast developing the exoplanet group there. During this period he led the development as PI of the SuperWASP Project and the initial development of NGTS. Since arriving at Warwick in 2012 he has been the Science Coordinator for ESA’s PLATO mission. Like a person, planets are born, evolve rapidly in the early stages of their lives, and spend most of their time interacting with others in their surroundings (in this case stars, other planets, comets, asteroids, etc.). At last, they die in a joint evolution with the system where they lived. The large crop of extrasolar planets discovered to date (around two thousand) is providing valuable information about how exactly these processes take place. But there are still many open questions that are key to understanding the whole picture. Starting from a planet’s birth and finishing with its death, I will briefly review some big projects and facilities aimed at answering these crucial questions. Planets are byproducts of stellar formation. Stars are formed after the collapse of a molecular cloud. The result of this process is a massive object (the star) surrounded by a circumstellar disc composed of gas and dust. This disc is indeed the incubator where planets will be formed. However, the exact mechanism of planet formation is still a mystery, with different theories trying to explain the process and to conjugate theory and the observations. A property that seems to have a key role in planet formation is the amount of gas and its lifetime in the disc. Also, the amount of warm water, and in general the chemical contents available in the disc will determine the type of planets that can be formed. Two key projects using data from the Herschel mission of the European Space Agency (ESA) aim at characterizing these parameters in the different stages of planet formation: GASPS and DUNES. They are producing impressive results with the detection of warm water vapor in these protoplanetary discs, a crucial ingredient linked with planet formation and the development of life. Additionally, the observations carried out by the ALMA radio-interferometer (Chile) are shedding light on the formation process, detecting protoplanets in the first stages of their live as well as possible signatures of multi-planetary formation. 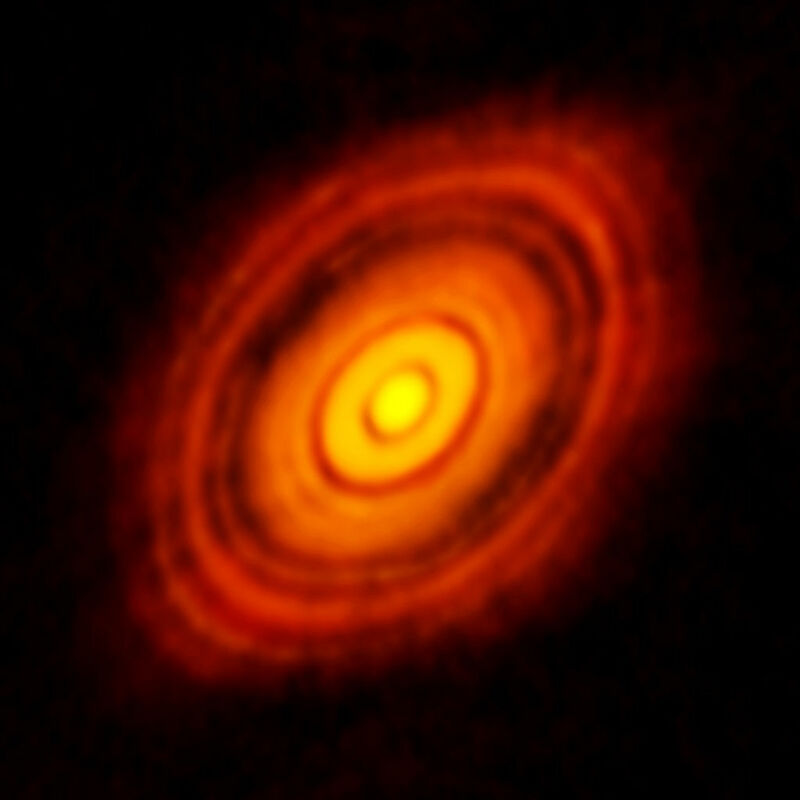 ALMA image of the protoplanetary disk around HL Tauri. The image shows clear dark rings that could be due to the presence of forming planets, although other theories (not involving planets) have also been proposed to explain them. Credits: ALMA (ESO/NAOJ/NRAO). During the process of forming a planet within a protoplanetary disc, other minor objects are also created. Moons, comets, asteroids, and minor planets are also by-products of this process and could play a key role in the subsequent evolution of the planetary system, as well as being crucial for the development and support of life. For example, we know that tidal forces induced by the Moon on our Earth have an important role in transporting heat from the equator to the poles, contributing to the climate patterns of our planet. Similarly, in other extrasolar systems, these objects may exist and play similar or even more important roles. Additionally, the properties of their orbits (inclinations, eccentricities, etc.) are a direct consequence of the dynamical evolution of the system during its first stages. Hence, the detection of minor bodies in extrasolar systems will contribute to our knowledge on planet formation and evolution, and potentially the evolution of life. The HET and TROY projects aim at detecting these minor objects. First, the HET project has the challenging goal of detecting the first exomoons—natural satellites orbiting around known planets. They have obtained different candidates, although no confirmation has been published as for today. The TROY project aims at detecting exotrojan planets—bodies co-orbiting with known extrasolar planets in the stability points of their orbit. In the Solar System, we know that a cloud of trojans inhabits the Lagrangian points L4 and L5 of Jupiter’s orbit. Indeed, even our Earth has a long-term 300-meter diameter object co-orbiting with us. 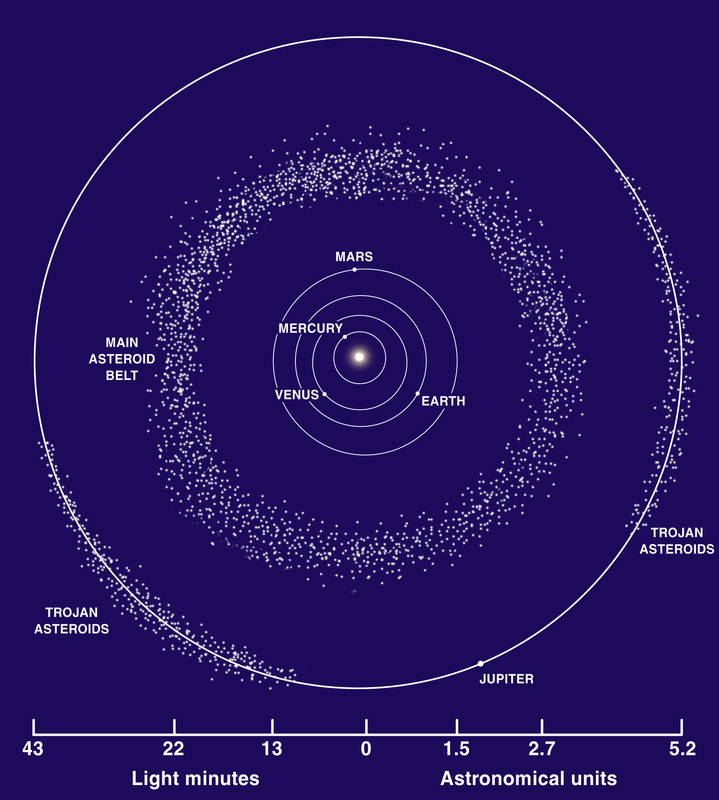 Illustration of the minor bodies in the inner part of the Solar System, including Jupiter trojans and the main asteroid belt. These objects are byproducts of planet formation and have key information about that process. Detecting them in extrasolar systems may help us to understand the early evolution of planetary systems. Credits: NASA (Creative Commons). On the other side, important space missions are discovering large amounts of exoplanets with which we can start doing statistics of planet populations. For instance, thanks to NASA’s Kepler mission, we now know that solar-like stars in our Galaxy harbor on average 0.77 earth-size planets. This is a crucial discovery since it tells us that earths are more or less commonly formed in the Universe. 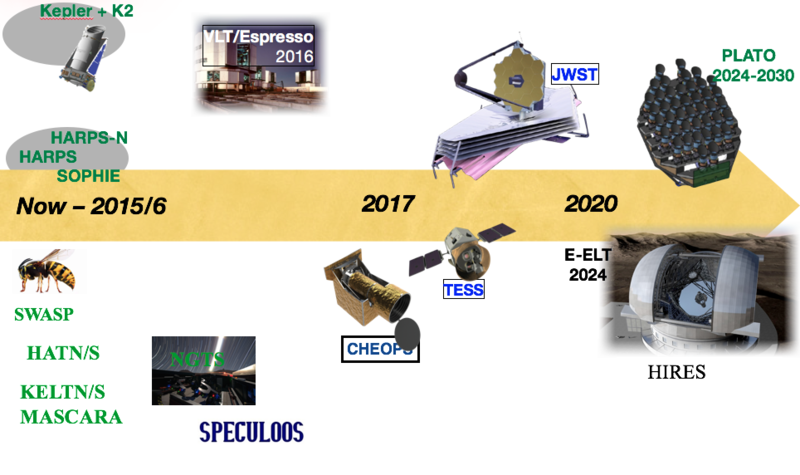 In the forthcoming years, new space missions such as TESS, CHEOPS, PLATO, Gaia, or JWST will each contribute to improve these numbers by detecting, and characterizing, extrasolar systems in other niches (for example, long-period planets). The end of the story, as it happens in our own lives, is tragic. After several billion years, the host star exhausts its internal fuel (hydrogen) and starts to contract, while the external layers expand, making the star several times bigger than it was during its adult phase—becoming a red giant. The consequence of this process for the surrounding planets can be traumatic and catastrophic, possibly being engulfed by the star after a spiraling in-fall. But some of them can still survive. Determining the conditions for a planet to be engulfed by its host star is still a matter of debate. It is important to note that this process will also take place in our Solar System (although in several billion years). Hence, it is crucial to understand how planets die, and under which conditions, to know the future and the expiration date of our Earth. Several projects like EXPRESS, TAPAS or JOTA are currently looking for planets orbiting giant stars in order to contrast the theoretical predictions with actual data to shed light on the end of planetary systems. 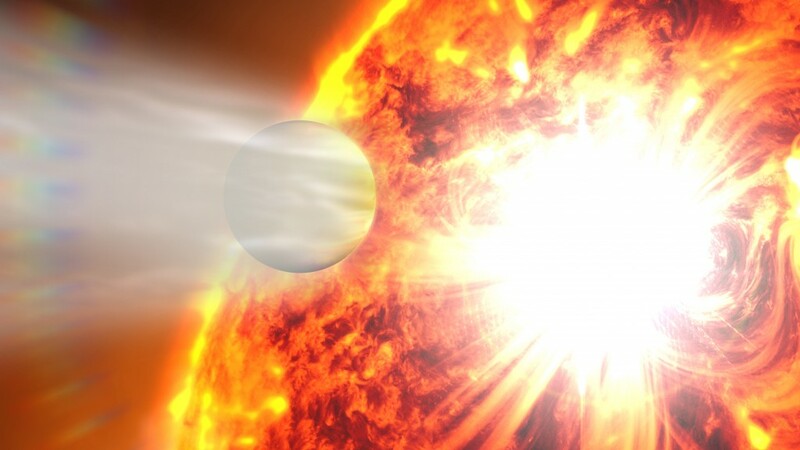 An artist’s impression of HD 189733 b showing rapid evaporation of the atmosphere. Credits: NASA’s Goddard Space Flight Center (Creative Commons license). Dr. Jorge Lillo-Box is a fellow at the European Southern Observatory (Santiago de Chile). 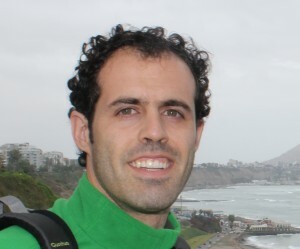 Jorge studied Physics at the Complutense University and University of La Laguna. Afterwards he moved to the Astrobiology Center (INTA-CSIC, Madrid) where he got his PhD in 2015. 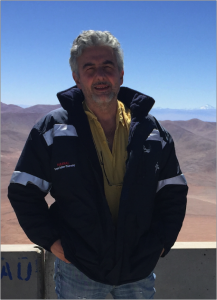 Since last year he is settled in Chile where, if he is not pointing to a star at the Paranal Observatory, he would be delving into the study of the evolution of planetary systems in the last stages of their lives and in the detection of minor bodies through the TROY project. Among the several planets he has discovered in different niches, we highlight the first planet transiting a giant star or the closest planet to a host star ascending the Red Giant Branch, Kepler-91b. Observatories are the astronomers’ lab, or rather, they are our spy-holes to observe the Universe—the vastest lab of all. Do you know someone who, when looking up at the sky, says: “Bah!, I don’t like it”? I really don’t, however, living in bright cities doesn’t give us many chances of testing such reactions; and maybe this is also the reason why the huge Universe is not something we use to think about every day. That’s why, when we meet someone and they want to know about our “starry profession”, they ask—with a mixture of curiosity and oddness—“How did you decide to become an astrophysicist?”. 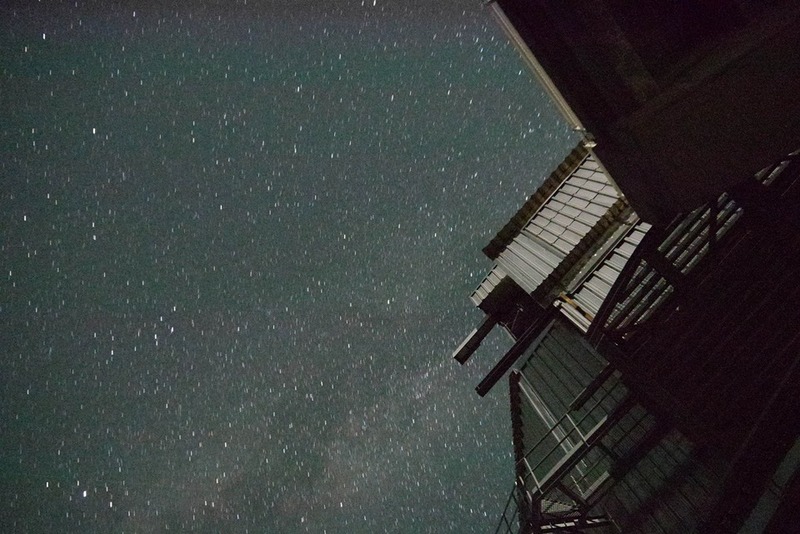 How life is in an observatory can cause the same feeling, sometimes I think even my mother doesn’t know what I’m doing up there—don’t be angry mom!—so in this article I’ll describe a bit of the daily routine on the mountain. Starting the trip in Granada’s airport. Credits: Zaira M. Berdiñas. As with many other trips, this one starts at the airport. But wait, that’s not fair, because before starting the journey to the observatory a lot of work was already done. Twice a year, telescopes offer their nights through the so-called “call for proposals”. This starts a period in which astronomers have to squeeze their brains and compete for writing the best science projects. Telescope time is expensive, and only those who prove that they will make the best use of it will be awarded with the opportunity of using it. “Time allocation committees” which are also formed by astronomers, decide who pass and who don’t. So, I’m at the airport, and this implies that our science project made the cut (hooray!). 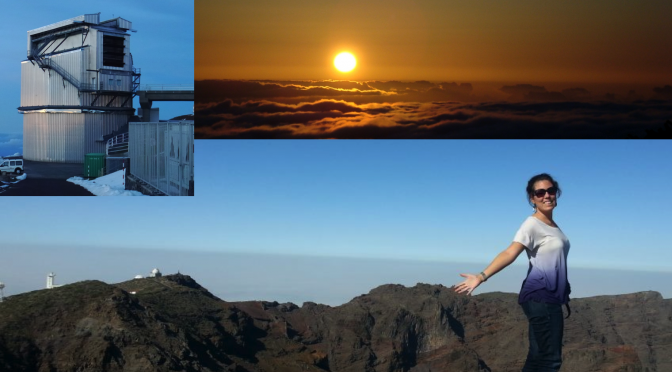 After a 3-hour flight I land at the island of La Palma; you may think I’m almost there, but hundreds of curves still separate me from the Observatory of Roque de los Muchachos. Carlos the driver, and after this winding road my friend, leaves me in the Residencia. This is the core of observatory life: here astronomers have late breakfasts and early dinners, sleep in the daytime, and even play ping-pong in their free time. But my watch shows it’s 4 PM and I have no time to lose before dusk. I take a car and I drive up to the Telescope Nazionale Galileo (TNG), where Vania, my support astronomer, is waiting in the telescope control room to explain to me how to set up the instrument I’ll use to collect my data: HARPS-N.
Left: Telescopio Nazionale Galileo (TNG). Right: Control room sited in the ground floor of the telescope building. Screens on the right are used by the telescope operator to monitor the weather and the telescope parameters, screens on the left correspond to HARPS-N. Credits: Zaira M. Berdiñas. In the same way that Pale Red Dot is using HARPS, settled at ESO’s La Silla Observatory (Chile), to collect the radial velocities of Proxima Centauri, tonight I’ll use HARPS-N, his twin in the northern hemisphere, to search for other planets orbiting other red stars. Once Vania has finished the training and we have initialized and calibrated the instrument response, I’m just in time for coming back to the Residencia, having dinner, picking up my “super-snack” for the night, reading some emails from my team wishing me clear skies, and coming back to the telescope with the dusk right on my tail. On my way up, the open dome tells me that Daniele, the telescope operator, may be ready to start observations. Roughly one hour after twilight, sky is dark enough to start the telescope focus procedure: the night has started. I spend the rest of the night observing my targets. That means sending the observation blocks to point the telescope and trigger the exposure, while I make sure that the spectra I’m collecting are good. Daniele, who is by my side, monitors the weather conditions and telescope parameters from almost 9 screens. It’s almost 2 AM and it’s the turn of the faintest star on my list. It requires a longer exposure and gives me the opportunity to go outside and enjoy one of the most astonishing skies that you can stare at and, why not, take some pics. Photograph of the Milky Way and the Telescope Nazionale Galileo taken whilst a long exposure is being acquired. Credits: Zaira M. Berdiñas. After almost 10 hours and more than one coffee, the new day dawns. After having closed all the systems, we drive all the way down to the Residencia, always with no lights to avoid bothering our colleagues in case they were still doing some final tests. And we are done, data will be analysed over the next few months but now it’s 7 AM and the night is officially over, the only thing awaiting for me is my bed. Good day! Zaira M. Berdiñas is a last year PhD student, working in the CARMENES spectrograph group at the Instituto de Astrofísica de Andalucía. Her research is mainly focused on searching for compact exoplanets and pulsations on M dwarfs by using radial velocity fiber-fed spectrographs. 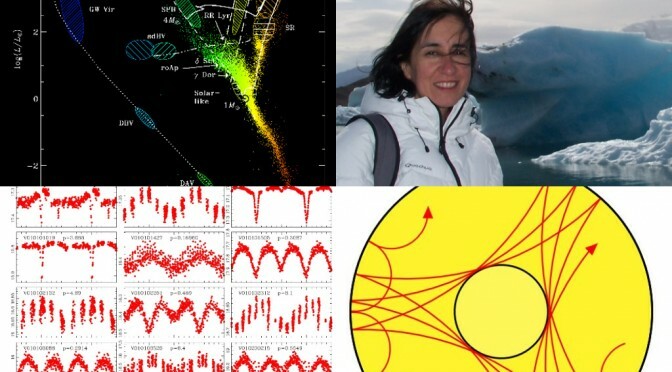 Specifically, she currently leads the HARPS-N observing campaigns of the project Cool Tiny Beats from which the Pale Red Dot was born, and she is also an editor of the palereddot.org website. 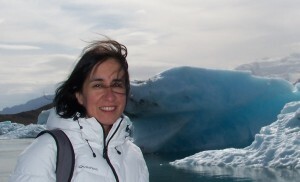 Zaira is also actively involved in instrumentation development. In particular she is part of the team which is developing the Radial Velocity Corrector (RVC), an alternative to the scrambling methods for fiber-fed high-precision RV spectrographs which are non-thermally stabilized. Planetary transits: how can one measure the mass, size, density, and atmospheric composition of a planet one cannot even see? Our Solar System is shaped like a rather flat disk: all the major components are very close (to within a few degrees) to some imaginary “average” plane. Indeed, most (but not all) planetary systems are flat, so we can imagine other planetary systems as roughly disk-shaped. Relative to our own Solar system some of these flat systems will be seen “face on”, some will be “edge on”, and most will be somewhere in between. One result of this randomness is that only a small minority of these systems will be oriented in such a way that their orbital plane is close to our line of sight (i.e. “edge-on”)—but this serendipity has multiple wonderful results indeed! Planets in such a system will seem to pass, or transit, in front of their host star once every orbit—as seen from earth—blocking a small fraction of the host star’s light for a short while in a “mini Solar eclipse”. This, as we will see below, allow us to both detect new exoplanets and learn a great deal about them. Now, since stars appear like (very small) luminous disks, to a good approximation if half of the stellar disk is blocked by something opaque then we will see that star’s light diminish by half—this is what exoplanetary transits are all about. Firstly, we may ask: how small or large will this “mini eclipse” be? It is useful to have some examples: a Jupiter-like planet is about 10% the diameter of the Sun, so it can block about 1% of the Sun’s light (since the area of a circle is proportional to its diameter squared). Reversing this relation, if an astronomer finds a 1% deep transit-like dimming of a far-away star, he/she will conclude that the transiting object is approximately 10% the diameter of the host star—without ever measuring the size of the planet by an image that actually resolves the planet (obtaining such an image will require an unrealistically large telescope with a primary mirror about a kilometer in diameter). Now, a 1% dimming of a star is something one can measure from the ground—so ~15 years ago multiple surveys started looking for such large planets (scale of Jupiter in size)—monitoring millions of stars every few minutes for months, and even years, on end. Why millions? Because not all stars are bright enough or stable enough to allow the detection of a 1% transit, and only a fraction of them actually host a large planet close-in to its host star (a so-called “Hot Jupiter”), and only a fraction of those are aligned close to our line of sight… so one has to start with millions of stars to find a handful of transiting planets. Processing this large amount of data requires sophisticated algorithms and a large degree of automation, and so quite some time passed before astronomers found out how to do this the right way. Today, a few hundreds of these ground-based detected transiting planets are known. Top: As planets revolve around their star they exhibit phases akin to the phases of the Moon, since we see variable parts of their day or night sides throughout their orbit. This picture, however, is not what one can see with a telescope. Bottom: the observed flux (=brightness) of a star hosting a transiting planet. We will see a different amount of flux depending on the part of the planetary orbit: when the planet goes behind the star we will see just the star alone. At all other phases we will see both the star and the planet, and the latter will also block some of the star’s light during transit. Unfortunately, detecting transiting planets much smaller than Jupiter is very difficult from the ground, if not impossible: an Earth-sized planet is a about tenth the diameter of Jupiter, or 1/100 the diameter of the Sun, so if can only impart a transit which is about 0.01% deep, much too small to be detected from ground-based observatories, which have to combat things like day/night cycles, weather, atmosphere, variable temperatures, etc.—all of which make precise measurements difficult. Fortunately, space-based observatories simply avoid all of these disturbances, so even by simply placing the exact same equipment in space one immediately gets much more precise measurements due to the very stable environment available in space—with no day/night cycles, no weather, no atmosphere etc. Indeed, NASA’s Kepler mission did more than that: the instrument aboard the Kepler spacecraft was highly optimized to the precise measurement of stellar brightness that does allow the detection of small Earth-like planets despite their small transit depth and long period. This, in turn completely revolutionized the exoplanets field. Before Kepler about 300 exoplanets were known from all transit and radial velocity surveys combined, while Kepler alone found (as of today) over 1,000 confirmed planets, with >3,000 more candidates still waiting confirmation. Importantly, the kinds of planets Kepler found were very different from the giant planets usually found by other transit and radial velocity surveys; it found that most planets are small, with the most common type of planet only 2-3 times the diameter of the Earth. In fact, so many planets were found that it is now understood that most stars have at least one planet, and likely multiple planets, around them. Indeed, finding lots of planets is a lot of fun, but there is more—much more—to transiting planets than that. For starters, by combining the mass (from instruments like HARPS that measure precise radial velocity) and radius (from transits), one can easily calculate the planet’s mean density, which in turn can tell us something about the bulk composition of the planet. It was found that planets are indeed far more diverse than anyone had ever suspected before—with planets having densities spanning about two orders of magnitude; some planets are almost all high-density iron while others are less dense than Styrofoam, virtually devoid of solid material and probably all made of light elements like hydrogen and helium. One of the early successes of the transit method stemmed from the understanding that the top layers of the planetary atmosphere are rarefied enough so they are not completely opaque. This means that as the planet transits the host star, some of the stellar light that passes through these layers is not completely absorbed and actually makes it through to us, and now it carries some information about the conditions that exist in these upper layers of the planetary atmosphere in its spectrum. By subtracting the on- and off- transit spectra one can isolate this faint planetary contribution to the overall light coming from the star, and this indeed allowed the detection of multiple interesting molecules on these far-off worlds, for example: carbon monoxide, carbon dioxide, water, hydrogen, methane and more. In the future the detection of “biomarkers”—evidence of extraterrestrial life—will be attempted using this technique. 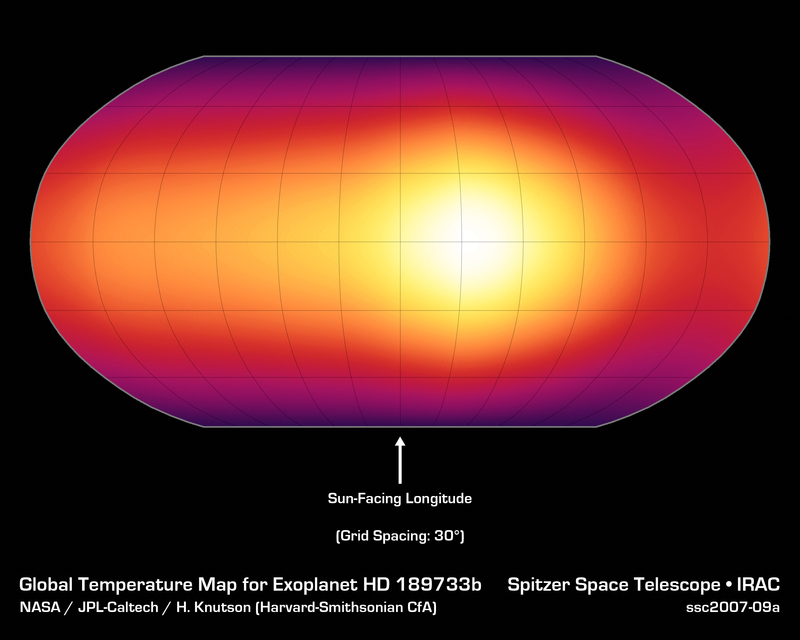 The observed global temperature map of exoplanet HD 189733 b, the first of its kind, as inferred from the different phases of this remarkable hot Jupiter. Temperatures range from about 650 degrees Celsius on the coldest part, to 930 degrees Celsius on the hottest. Note that this hottest spot on the planet is not directly in the middle, i.e. it is not just “below” the star or at “high noon”—but rather shifted to the East. Moreover, by observing these planets at longer wavelengths, in the infrared, one can observe light emitted from the planet (vs. just reflected from—or refracted by—it) and thus permit us to measure the planet’s temperature on the day side. Some planets also allow the creation of rudimentary temperature maps (!) for them, finding that the hottest point on the day-side of the planet is not exactly facing the star—but shifted from it by strong, persistent jet streams. At that point one can start talking about the planet’s energy budget and global weather patterns, cloud formation and circulation,… characterizing the planet, and not just detecting it. 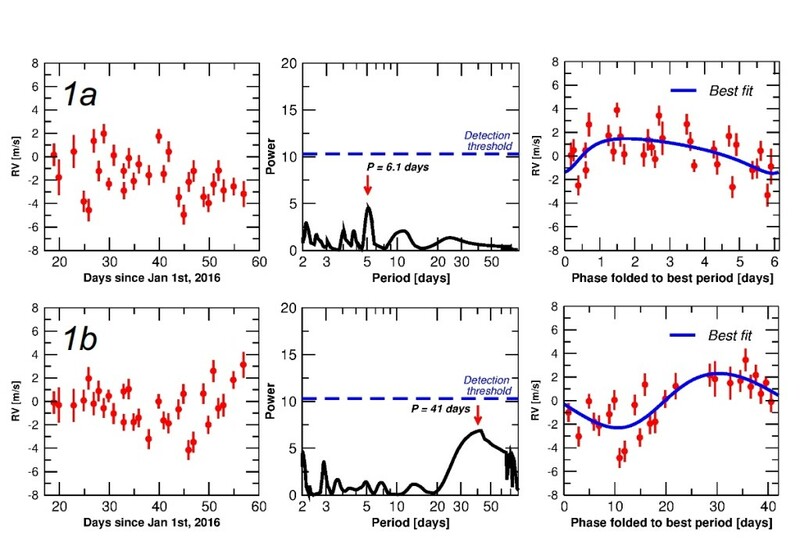 In some other cases “transit timing variations” were identified: the transits of some pairs of planets are not quite periodic but they appear to transit slightly earlier or later than they “should”, and in sync; when one was late, the other was early. 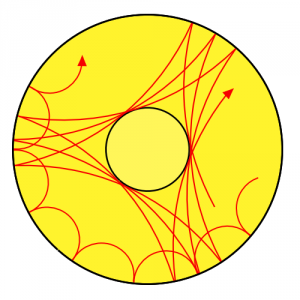 These perturbations are cause by the gravitational interaction between different planets in the systems: both are pulling on each other, disturbing their regular rhythms. 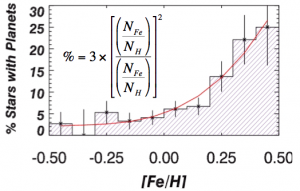 This allows us to reverse the problem and ask: “if I do see these irregularities, what kind of masses can cause them?”, the answer effectively finds the mass of the planet(s) in the system without ever using the expensive resources like HARPS—but for free—just by carefully analyzing the times of transit. By studying yet finer details of the transit light curve—some of which have been detected and some are still too difficult to find even with current space-based data—many more things can be inferred about the planet: from planetary rings, from planetary oblateness to a measure of its rigidity, to planetary rotation rate and mean wind speed—all are derivable (in principle) from transit light curves. We are thus able to sometimes measure the size, density, composition, dynamical interaction and much more for transiting planets, and I remind you: all that for a planet we can’t resolve or even directly see, and only because by some pure chance they happen to cross the face of their host star as seen from Earth. About the author. 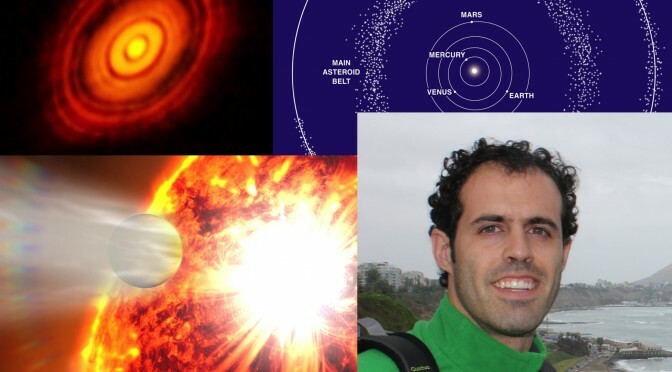 Aviv Ofir is a Dean’s Postdoctoral Fellow at the Weizmann Institute of Science’s Planetary Sciences department. Prior to arriving at Weizmann, he was a Minerva Postdoctoral Fellow at Göttingen University in Germany. He has been a member of the science team of the HATNet ground-based transit survey, as well as the space-based CoRoT and Kepler transit surveys and the Cool Tiny Beats radial velocity collaboration. Dr. Ofir has extensive experience analyzing large photometric datasets, and invented a number of techniques for the efficient detection of faint signals in these data. Excuse me? Stars what? Yes, stars do beat! Even our own Sun! You may think that stars are immobile, comfortably and quietly burning their nuclear fuels up there in the sky, but the reality we have got to know through observations is quite different. Stars ‘breath’ and ‘contort’ and ‘wriggle’ in a variety of ways, altering their radii and surface temperature which produce periodic changes in their luminosity and surface velocity that we detect with our telescopes and instruments. These effects are known by the technical name of pulsations, or oscillations, and the technique that tries to extract all possible information from these pulsating stars is known as Asteroseismology, or, in the specific case of our Sun, Helioseismology. The naming responds to the techniques used, analogous to the Earth-seismology, that extract information from seismic waves propagating in the interior of our planet to derive the composition and stratification of the Earth. Asteroseismology analyses the frequencies of oscillation of the light coming from the stars, which are a fingerprint of the star’s interior chemical composition and structure, as well as of other fundamental parameters such as its mass, density and age. So, what are these pulsations? Pulsations are, strictly speaking, pressure and gravity waves (usually referred to as p- and g-modes) that propagate in the interior of the star; you can think about them as sound and maritime waves respectively, this meaning that changes in the pressure and buoyancy are responsible for them. P- and g-modes propagate at different depths inside the star (see Fig. 1), allowing to probe the different regions just by measuring their frequency on the surface, that would be, otherwise, inaccessible. The fact that some of these oscillations are sound waves, is why, in a more poetic way, we talk about the ‘music of the stars’. Sound waves resonate inside the stars, in much the same way as in a musical instrument, and although their frequencies are too low for us, humans, to hear -and sound does not propagate in vacuum-, some scientists have amplified them, so that we can actually hear how they would sound. The experience is, however, not the pleasantest, as star’s sound waves are not harmonic. But how do pulsations originate? Pulsations originate from the displacement of the plasma inside the star. The radiation originating from nuclear fusion in the star’s core or layers try to find its way up to the surface, but in doing so, there are some stones in its path: one are the so called partial ionization zones of chemical elements. In these layers, the star’s opacity increases with increasing pressure, holding the radiation coming from the interior and pushing the upper layers, which then become more transparent, releasing the radiation and falling in afterwards, starting the cycle again, as if it was an inhaling-exhaling process, in the same way as an engine works. 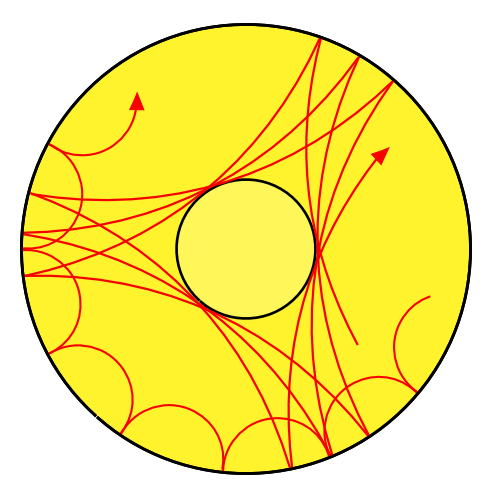 If the excitation produced in these regions is larger than the damping produced in all other ones, then the star will likely show oscillations in its surface. This is called the kappa-mechanism and it is responsible for the pulsations in several types of variable stars such as RR Lyrae, delta-Scutis, beta Cephei, Hot Subdwarfs or White Dwarfs. In stars that have an inner radiative zone and an outer convective zone, the radiative flux can be blocked and then released at the interphase -or tachocline- of these two layers in a cyclic way, like it is the case for gamma-Doradus variables. Finally, in these partially convective stars, such as our Sun, an stochastic excitation of pulsations, due to the turbulent convective motions in the surface of the star -as it happens when we heat water on a pot- can also be produced. Do all stars pulsate? And does Proxima pulsate? That’s a good question! 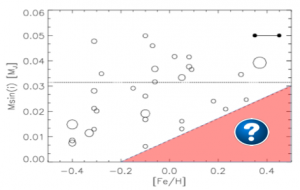 To answer it, we may take a look at the Hertzsprung-Russell pulsating diagram (Fig. 2) which locates all types of known pulsating variables, in terms of their temperature and luminosity. The diagonal dashed line that traverses it locates the stars in the main sequence (MS), where they burn hydrogen in the core. Some of the delta Scuti are pre-MS stars, while giants like Cepheids or Mira lie above the MS and subdwarfs and white dwarfs, like GW Vir, sdBV and DAV, that sit below it, are all post-MS more evolved stars. So, it seems that all stars no matter what their mass or temperature, or their evolutionary stage, have the potential to pulsate, although beware that not all stars located there do! 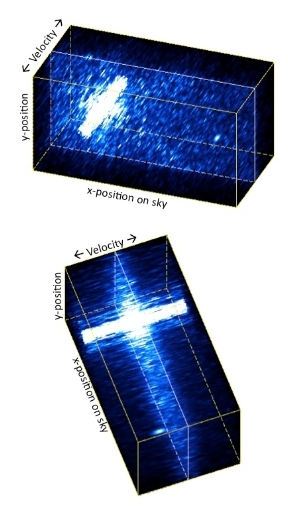 that is, these instability strips are not pure, but populated also by ‘normal’ non-pulsating stars. In the case of Proxima, and more generally for M dwarfs, we do not know it yet. Pulsations have been theoretically predicted, but not yet detected observationally, although we are looking for them! We can only be sure that, if oscillations exist, they will be of very low amplitude, of the order of millionths of a magnitude if we monitor the incoming amount of light, or less than 1m/s if we measure how much the surface of the star rises and falls. If oscillations had larger amplitude than these limits, we would have already detected them. So, explain me then how do you detect pulsations? The frequencies of the oscillations, or inversely, their periods, may vary between only a few minutes, to hours or a few days. For M dwarfs, like Proxima, the range is predicted to vary most likely between only 20 minutes and 3 hours. To detect these oscillations, we use two techniques also used in the search for exoplanets: photometry and spectroscopy. Photometry measures the amount of light coming from the star over a period of time: if the star is non-variable, its light-curve, or light received as a function of time, will be constant, whereas it will periodically vary if it is a pulsating star (see Fig. 3). The same technique is used by satellite space missions dedicated to search for planetary transits, such as KEPLER and CoRoT, and future PLATO, that measure the diminishing of the light of a star when an orbiting planet traverses our line-of sight. Spectroscopy, through the radial velocity method, measures the periodic velocity changes in the spectral lines of the star caused by the rising and drop of the stellar surface due to the oscillations, just as velocity changes are caused by the gravitational tug of a planet orbiting the star; this is the same type of observations we are carrying out for Proxima with HARPS spectrograph. Then, what role do pulsations play in the discovery of exoplanets? First, we have to be sure that pulsations are not mistaken for a planet, as sometimes, they can mimic them; also if the star is pulsating, the planet search observations have to be designed such as to minimise the influence of the pulsations in the data acquisition, or to a posteriori correct the data from them, before the signature of a planet can be assessed. However, most interestingly, when a pulsating star is a planet host, we can very precisely derive its mass, radius and age, and this is an unique and precious way to pin down the physical parameters of the planet and its evolutionary history. So, let’s hope that we find lots of planets surrounding pulsating stars! About the Author. 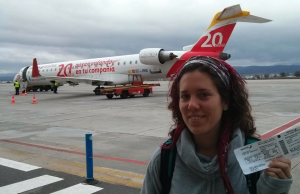 Cristina Rodríguez López is a post-doctoral researcher at the Instituto de Astrofísica de Andalucía (CSIC, Spain) within the group ‘Low-mass stars and exoplanets and associated instrumentation’. Her research interests include asteroseismology of low-mass stars in different stages of evolution and the search for exoplanets. 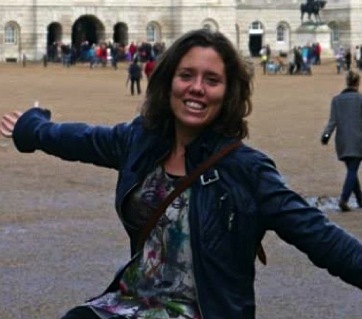 Previously, she received her PhD from the University of Vigo and was a post-doctoral researcher at the Laboratoire d’Astrophysique de Toulouse-Tarbes (now IRAP, France) and a visiting scientist at the Department of Physics and Astronomy of the University of Delaware (USA). She is responsible for the scientific workpackage ‘Asteroseismology of M dwarf stars’ within the CARMENES Consortium, which brings together 11 Spanish and German Institutions around the scientific exploitation of the CARMENES spectrograph, a new planet hunter focused on discovering Earth-like planets around M dwarf stars, much the same objective pursued by the Pale Red Dot project, of which she is also a co-investigator and editor. 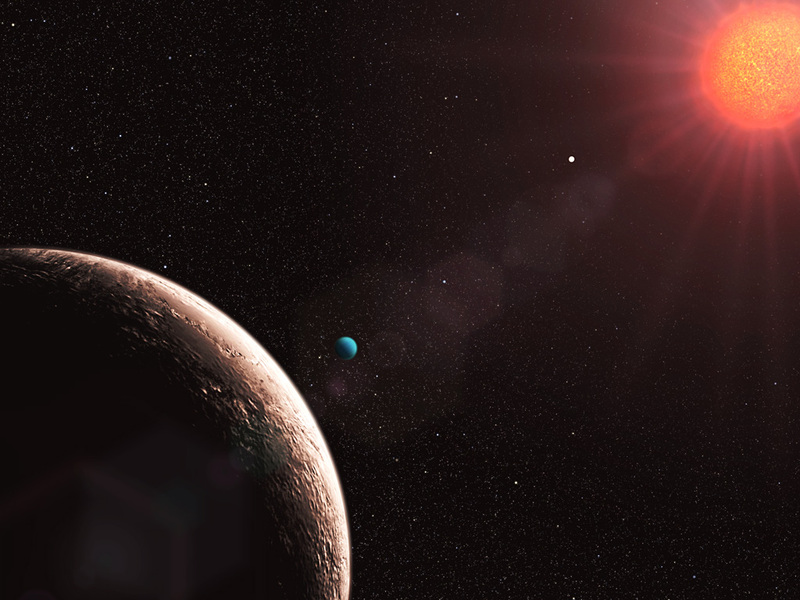 How amazing would it be if we found that there exists a planet, with a mass and temperature just like Earth, around our nearest neighbour—Proxima Centauri. How could we find out whether life exists on such a world? 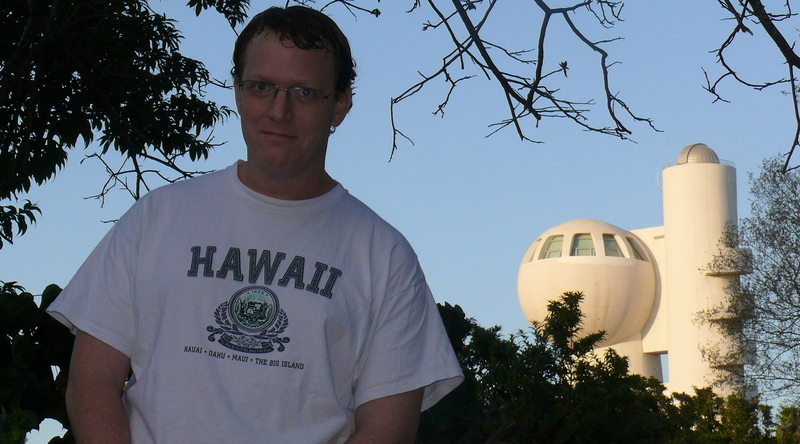 The Pale Red Dot project is all about following up a hint that such a planet may exist. This is extremely exciting. Finding such a planet may actually not be such a surprise. Proxima is a faint red dwarf star, seven times smaller than the Sun. From previous observations, for example using the NASA Kepler satellite targeting planets that transit their host star, it is clear that in general red dwarf stars indeed often have small rocky planets. Therefore, Proxima—our nearest neighbour at a distance of 4.2 light-years—could be expected to also host small planets. Since the luminosity of Proxima is one thousand times smaller than that of the Sun, the energy a planet receives from Proxima is that same amount less than it would receive from the Sun. Therefore a planet in an Earth-like orbit would be freezing cold. Astronomers like to think that to host life a planet needs to be able to sustain liquid water. It is crucial for life as we know it as a solvent; making the complex chemical reactions associated with biological activity possible. Indeed, no life on Earth can function without liquid water. For planets around Proxima it means that their orbital distances need to be significantly smaller, only a fraction of the Earth-Sun distance, to be able to sustain life—corresponding to an orbital period of about two weeks, right in the ballpark of the possible planet chased by Pale Red Dot. Artist’s impression of a habitable planet around a red dwarf star (credit ESO/L. Calçada). Let us for now assume that the Pale Red Dot observations indeed reveal such a planet. How could we possibly find out there is life on it? Let me first sketch the picture of why this is so difficult. For hundreds of years astronomers have wondered whether there is life on Mars, without a conclusion yet. Over the last fifty years, Mars research has accelerated at an immense pace. NASA and ESA have sent many probes that dig, drill, and can measure the Mars atmospheric constituencies to high precision—and still we do not know. One has to realize that we will never be able to do this for extrasolar planets. The distances are simply too large. Even Proxima, our nearest neighbour star, is more than two-hundred-thousand times further away than Mars. We simply cannot send probes to Proxima on practical human time scales. Therefore, any information we collect from possible planets orbiting Proxima can only come from remote sensing—observing them using our telescopes on and around Earth. Is it then entirely hopeless that we could find life? Luckily not! Of course, if the situation is like on Mars, where life may be hiding deep under the surface, or on Jupiter’s moon Europa, where simple life may be deep in its ocean, it will indeed be hopeless. We will never be able to recognize it from a distance. However, the situation is very different for Earth. If an alien civilization would point a telescope at Earth and measure its spectrum, it can see clear signs of biological activity. They can see that molecular oxygen is very abundant in our atmosphere, which is only present due to the organisms that produce oxygen as a waste product (which subsequently animals like us use as an energy source). Oxygen is a very reactive gas, which you do not expect to find in an atmosphere like ours. Indeed it took life on Earth more than a billion years before the oceans were saturated enough that the oxygen they produced ended up in the atmosphere. If all life on Earth would cease to exist, all atmospheric oxygen would disappear on a very short time-scale. Therefore we call oxygen a biomarker gas—it can provide evidence for biological activity on an Earth-like planet. Note however that a lack of oxygen does not mean there is no life. It could still hide under a rock like possibly on Mars. Also, for more than a billion years there was abundant life on Earth without a significant amount of oxygen in the atmosphere. Anyway, at least we can start somewhere. So how could we detect oxygen on a planet more than four light years away? Characterizing a planetary atmosphere is significantly more difficult than finding the planet, like is being tried now with the Pale Red Dot project. Most of the techniques used to find planets, including the radial velocity method used for Proxima, are indirect methods. They do not identify one single photon from the planet, but instead indirectly infer the presence of a planet—e.g. 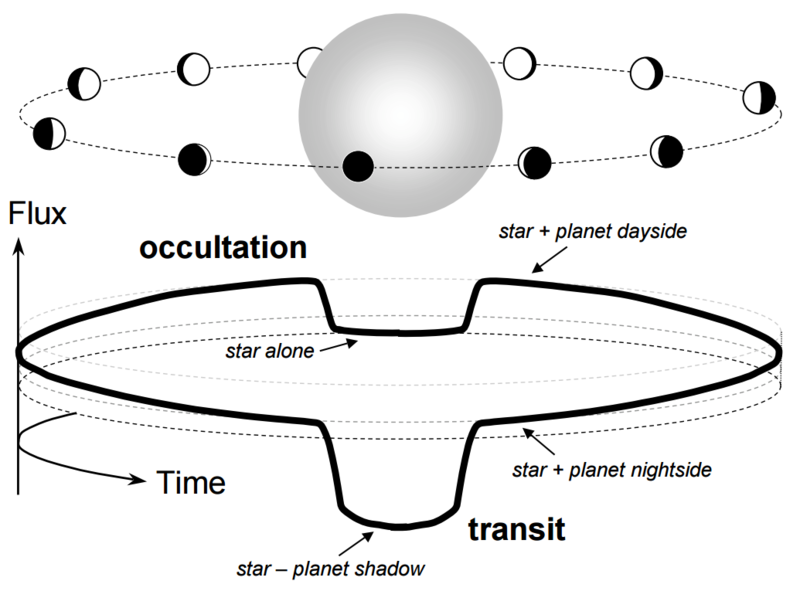 using the gravitational pull of the planet on the host star, or the moment a planet transits the disk of its host star blocking a small fraction of starlight that can be observed. This can no longer be the case for atmospheric characterization. We really need to identify photons from the planet as a function of wavelength, and in this way build up a planet spectrum. Although this is very difficult, this can be done, but is so far almost exclusively achieved for hot gas giant planets. Bird’s eye view of ESO’s Very Large Telescope which is used for many exoplanet characterisation observations (credit: J.L. Dauvergne & G. Huedepohl (atacamaphoto.com)/ESO). Broadly speaking, separating the planet’s light from that of the star can be done in the time, spatial, spectral and polarization domain, or using combinations of these. An example of the time domain is transmission spectroscopy. When a planet, as seen from Earth, moves in front of its host star, a little bit of starlight filters through the planet’s atmosphere, leaving an imprint of absorption from its atmospheric constituencies. A planet can also be eclipsed by its host star, temporarily blocking the planet light, which can be measured. In such a way the thermal emission spectrum or reflected light spectrum can be determined. However, such transit and eclipse observations require that the planet orbit is seen exactly edge-on – which will only be a small probability for the alleged Proxima planet. We have a better chance by trying to separate the planet from the star in the spatial domain. This is called direct imaging, or high-contrast imaging. Using a combination of techniques the starlight can be suppressed by orders of magnitude, leaving the planet signal coming from a slightly different direction unaffected. Although Proxima is our nearest neighbour, the targeted planet’s orbit will be very close in—only ~1/200,000th of a degree (20 milli-arcseconds) as seen from Earth. The sharpness of a telescope directly scales with its diameter, implying that revealing a planet at such a small angular distance from its host star requires a mirror diameter of at least 25 meters. Even the James Webb Space Telescope, which will be launched in 2018, will not be able to separate this planet from its host star. We would really have to wait until the next generations of ground-based telescopes come online, like the US Thirty Meter Telescope and Giant Magellan Telescope, and the European Extremely Large Telescope. Even with these giants it will be a real challenge—we will have to look through our own atmosphere to detect the atmosphere of the planet. However, we have been practicing just that using giant planets over the last decade, and we are starting to get pretty good at it! We will have to be patient though—do not expect the specific instrumentation needed to detect oxygen to be ready before 2030. A long wait, but the prospects are very exciting! About the Author: Ignas Snellen is Professor in astronomy at the University of Leiden in the Netherlands. After concluding his PhD research in Leiden in 1997, he worked for three years as a postdoctoral fellow at the Institute of Astronomy in Cambridge (UK), after which he became an astronomy lecturer at the University of Edinburgh (UK). He returned to Leiden University in 2004. 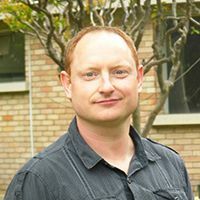 Snellen and his group develop observation and data-reduction techniques for ground-based telescopes, particularly geared to be used for the future extremely large telescopes (ELT). He and his group pioneered studies of molecules in exoplanet atmospheres using high resolution spectroscopy in the near infrared. Now that we have collected 1/2 of the observations with HARPS, LCOGT.net, and ASH2, let us share a glimpse of how the HARPS Doppler data looks. As seen in the article ‘The signal’, we expect some variability of a ‘few’ meters per second, but not larger than 4–5 m/s, otherwise the UVES survey would have spotted it. Unfortunately, we cannot disclose the real data to avoid biasing the future revision of the manuscript. Instead, we present you with a few examples of Doppler measurements similar to those we are obtaining on Proxima Centauri. 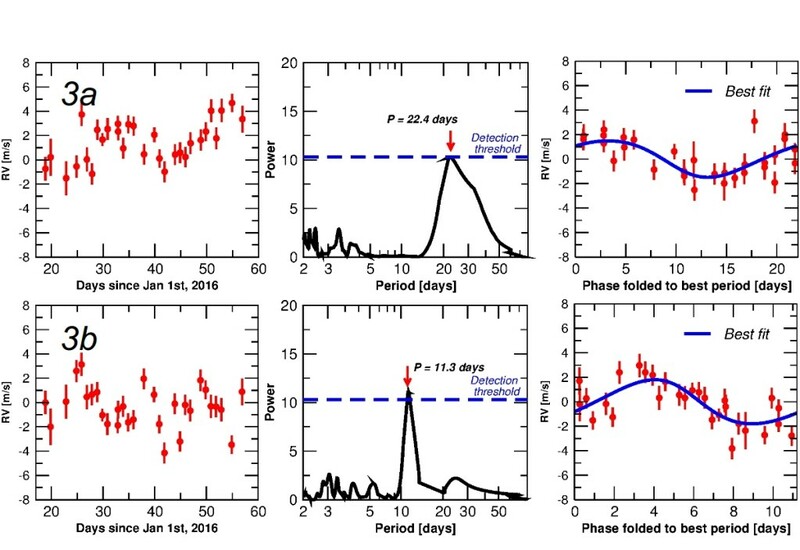 These are simulated datasets using the same HARPS observation dates as in the Pale Red Dot Campaign, and they reproduce the three most likely outcomes of these first thirty measurements. But there is a twist! One of the six data sets actually corresponds to the ‘real’ observations… can you guess which one it is? The left panels in Figure 1 show two examples of typical datasets that only contain random noise. The vertical small lines on each point are called error bars, and illustrate how uncertain each measurement is (~1 m/s). Note that depending on weather conditions some measurements have larger error bars. The central panel shows a graphic called a periodogram. Periodograms tells us which are the most significant possible periods in the data and allows us to quantify whether or not a signal is strong enough to be detected. In this example we set the detection threshold at a false alarm probability of 0.1%. That is, peaks over the blue dashed line would correspond to signals with false alarm probabilities smaller than 0.1%. Neither of these two datasets reveal a significant signal. Here we show two datasets that contain a possible Doppler signal, but these have been corrupted by non-periodic stellar activity. As in case 1, neither of the sets is sufficient to confirm a signal. Accumulation of data over the campaign should boost true planet candidates above the detection threshold, while pushing down the significance of the spurious ones. In cases like these, we would try to model stellar activity using photometry and other spectroscopic measurements to see if part of the variability could be explained by stellar noise. As an example of techniques used to achieve this, see the interview to Prof. Suzanne Aigrain. In this case we have two simulated data-sets with bona fide planet signals that clearly dominate over the noise (Figure 3). This would be the best case scenario for the Pale Red Dot campaign. Still we would need to investigate the photometry and other activity indices for activity related variability. Dlaczego mamy obsesję na punkcie metali! Obfitość metali, lub metaliczność, obiektów we Wszechświecie, ma istotny wpływ na wiele cech tych obiektów. Dla przykładu w przypadku supernowych, gwałtownych eksplozji stanowiących śmierć masywnych gwiazd, metaliczność umierającej gwiazdy przed kolapsem, który prowadzi do eksplozji, odgrywa główną rolę w określeniu typu supernowej, a tym samym ilości energii uwolnionej w eksplozji. Z drugiej strony, w środowisku egzoplanetologów  metaliczność gwiazd uzyskała zupełnie nowe znaczenie w 1997 roku, kiedy to zbadane zostały trzy gwiazde macierzyste nowych egzoplanet. Okazało się, że wszystkie trzych gwiazdy miały dużo większą zawartość metali w atmosferach niż Słońce. Okazało się, że to tak zwane gwiazdy bogate w metale. W kolejnych 19 latach od tego odkrycia astronomowie odkryli, że istnieje bezpośredni związek pomiędzy ilością atomów żelaza w atmosferze gwiazdy i prawdopodobieństwem, że wokół niej krąży gazowa, olbrzymia planeta. De facto, okazało się, że w przypadku gwiazd podobnych do Słońca, charakteryzujących się metalicznością trzy razy wyższą od Słońca, ponad 30% z nich posiada gazowe olbrzymy podobne do Jowisza, podczas gdy tylko 3% gwiazd o masie podobnej do Słońca posiada tego typu planety. Ten mniejszy procent gwiazd o niższej metaliczności wokół których krążą gazowe olbrzymy ujawnia się także w gwiazdach o jeszcze mniejszej zawartości metali. Zaledwie 0,3% gwiazd o metaliczności równej 0,1 metaliczności Słońca posiada gazowe planety. Ten związek stanowił pierwszy bezpośredni związek między właściwościami gwiazd mierzalnymi obserwacyjnie, a ich układami planetarnymi. Okazuje się, że taki związek jak ten między ilością gazowych olbrzymów a metalicznością gwiazdy, stanowi kluczowy element procesu formowania planet poprzez akrecję. W tym czasie główne teorie formowania planet skupiały się wokół akrecji jądra lub kolapsu grawitacyjnego. Proces formowania planet przez akrecję to proces typu “dół-góra” (bottom-up), gdzie najmniejsze cząsteczki pyłu tworzącego dysk materii pozostały po procesie formowania gwiazdy, zaczynają się ze sobą zlepiać tworząc to co raz większe kamienie, skały i w końcu planetazymale. Planetazymale mogą dalej rosnąć poprzez akrecję większej ilości pyłu z dysku, lub pozyskując co raz więcej gazu z dysku. Z drugiej strony kolaps grawitacyjny to proces “góra-dół”, w którym dysk ulega fragmentacji na mniejsze obłoki pyłu i gazu wskutek niestabilności grawitacyjnej fragmentów dysku, które następnie z czasem zapadają się w sobie tworząc olbrzymie obiekty planetarne krążące wokół centralnej gwiazdy. Tak czy inaczej, warto pamiętać, że Ziemia, na której powstały istoty żywe, powstała z resztek po procesie formowania się Słońca. Procent gwiazd wokół których krążą gazowe olbrzymy w stosunku do metaliczności gwiazdy ([Fe/H]). Wyraźnie widać, że gwiazdy z większą ilością metali w atmosferze mają dużo większą szansę na powstanie w ich pobliżu gazowych olbrzymów. Czerwona krzywa wskazuje najlepsze dopasowanie do danych (zamalowany obszar) a powyższe równanie opisuje model. Tak jak napisano w tekście, procent gwiazd wokół któych krążą gazowe olbrzymy wzrasta wraz ze wzrostem zawartości żelaza (Fe) w stosunku do wodoru (H) w atmosferze gwiazdy. Źródło: Grafika zmodyfikowana w stosunku do oryginału opublikowanego przez Fischer & Valenti 2005, ApJ. Oba te mechanizmy prowadzą do możliwych do przetestowania założeń, a stosunek gazowych olbrzymów krążących wokół gwiazdy w funkcji metaliczności gwiazdy był tym, który prowadził do różnych wniosków. Z uwagi na fakt, że model akrecji jądra zaczyna się od sklejania najmniejszych drobin pyłu prowadząc do powstania większych obiektów – im więcej pyłu w dysku, tym szybciej takie struktury powstaną, i tym szybciej owe jądra będą mogły pozyskać gaz z dysku zanim dysk rozpłynie się w przestrzeń międzygwiezdną. Ponieważ dysk to tylko gruz pozostały po formowaniu się gwiazdy centralnej, dyski bogate w pył powinny istnieć wokół gwiazd bogatych w metale, czyli o większej metaliczności, co wydaje się zgodne z obserwacjami. Z drugiej strony model kolapsu grawitacyjnego nie zależy od ilości pyłu w dysku i po prostu dyski o mniejszej zawartości pyłu powinny prowadzić do powstania równie wielu dużych planet jak w dyskach bogatych w pył – co oznacza, że żadne róznice między nimi nie powinny być obserwowane. Dlatego też był to kluczowy dowód na to, że planety powstają w procesach “dół-góra” takich jak akrecja jądra. Dzięki najnowszym osiągnięciom technologii w laboratoriach oraz najnowszym danym dostarczanym astronomom przez teleskopy znajdujące się na orbicie takie jak Kepler, okazuje się, że nie wszystko jest takie proste w przypadku planet o mniejszej masie, szczególnie planet o masie zbliżonej do Neptuna lub mniejszej. Okazuje się, że procent gwiazd, wokół których krążą takie planety, tzw. superziemie, nie rośnie wraz ze wzrostem metaliczności gwiazdy tak jak w przypadku gazowych olbrzymów. Co ciekawe – może być wręcz odwrotnie, tzn. planety o małej masie mogą częściej powstawać wokół gwiazd o niskiej metaliczności. Jeżeli populacja planet typu superziemia nie podąża tym samym torem co gazowe planety, co to mówi o procesie powstawania takich planet? Czy to oznacza, że nie powstają one w ten sam sposób poprzez akrecję jądra? Odpowiedź brzmi: nie, to wcale tego nie oznacza. Pamiętajmy, że akrecja jądra zakłada, że gazowe olbrzymy będą przeważnie powstawały wokół gwiazd o wysokiej metaliczności, ponieważ małe jądra, które zwiększają rozmiary do etapu dużego planetazymala zdolnego do przyciągania gazu muszą rosnąć wystarczająco szybko, aby załapać się na gaz, który mógłby uciec w przestrzeń międzygwiezdną. Niemniej jednak, planety o niskiej masie, które są zdominowane przez jądro lub nie wymagają dużych ilości gazu, nie muszą tak szybko powstawać. W otoczeniu charakteryzującym się mniejszą ilością metali, jądra powstają dłużej i dlatego też ich masa pozostaje niska, aż do momentu utraty dysku. Tym samym akrecja jądra także przewiduje, że planety o niskiej masie będą częściej występowały wokół gwiazd ubogich w metale niż gazowe olbrzymy – kolejny punkt dla teorii o formowaniu planet w procesie akrecji jądra!! Metaliczność gwiazd, wokół któych krążą planety w funkcji minimalnej masy planet odkrytych w tych układach. Należy wziąć pod uwagę, że jest to wykres tylko dla gwiazd, wokół których krążą planety o masie oszacowanej na masę Neptuna lub mniejszą. Czerwony obszar stanowi bardzo bogatą w metale część diagramu i wskazuje brak planet w porównaniu do bardziej ubogiego w metale obszaru w dolnej lewej ćwiartce wykresu. Źródło: Graphic modified from our paper discussing this observational result. Rola jaką metale odegrały w rozwoju ewoluującego wszechświata i powstaniu życia na Ziemi nie może być pomniejszana. Metale stanowią tkankę, która łączy nas z całym kosmosem. To ironiczne, że takie piękno ma swoje początki w tak gwałtownych wybuchach w przestrzeni kosmicznej. Jeżeli chodzi o Proxima Centauri, to gwiazda wyjątkowo bogata w metale, co oznacza, że jej mały dysk protoplanetarny może być bogaty w materię idealną do tworzenia planet. Możemy zatem mieć nadzieję, że część tych metali rozpoczęła chaotyczny taniec, który zakończył się powstaniem nowych planet i kto wie, przy takiej bogatej palecie metali, które mogły tam być obecne od początku, na owych planetach, które wykorzystały potencjał drzemiący w metalach, może powstało życie? Może właśnie projekt Pale Red Dot pomoże nam to sprawdzić!! O autorze. James Jenkins jest profesorem na Universidad de Chile w Santiago, stolicy Chile. Skryty między otaczającymi go Andami, na szczycie Cerro Calan prowadzi obserwacje pobliskich gwiazd, szukając i próbując lepiej zrozumieć planety pozasłoneczne i ich gwiazdy macierzyste. James otrzymał tytuł doktora na University of Hertfordshire w 2007 roku, a następnie przyjął stanowisko adiunkta na Pennsylvania State University, gdzie pracował nad Precision Radial Velocity Spectrograph. Pod koniec 2008 roku rozpoczął pracę na Universidad de Chile jako adiunkt, a następnie jako Fondecyt Fellow w latach 2010-2013. 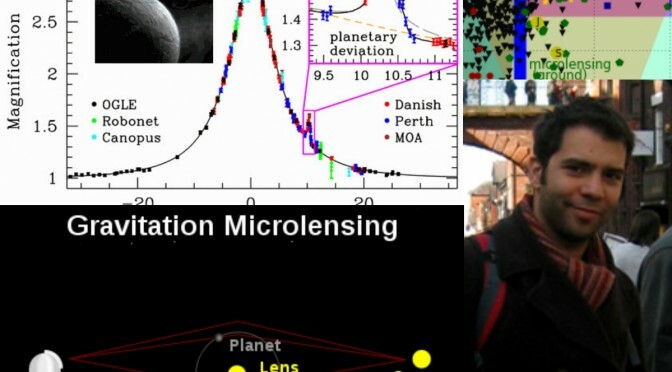 Jego główne pole zainteresowań obejmuje odkrywanie planet krążących wokół gwiazd bogatych w metale w ramach przeglądu Calan-Hertfordshire Extrasolar Planet Search, poszukiwanie planet o bardzo niskiej masie w danych obejmujących prędkości radialne oraz planet krążących wokół olbrzymich gwiazd. James bada także aktywność magnetyczną gwiazd, wokół których krążą planety, starając się zrozumieć jak to źródło “szumu” można odfiltrować z danych wykorzystywanych do poszukiwania planet. James jst bardzo aktywnym członkiem projektu Pale Red Dot i jest jednym z edytorów palereddot.org. Wielki Wybuch to nazwa nadana aktualnie obowiązującemu modelowi momentu powstania Wszechświata. Nazwa “egzoplaneta” to skrót od wyrażenia “planeta pozasłoneczna” oznacającego planety krążące wokół gwiazd innych niż Słońce. Pamiętaj, że metoda detekcji za pomocą prędkości radialnych nie pozwala na ustalenie bezwzględnej masy towarzyszy gwiazdy, a jedynie ‘masy minimalnej’, ponieważ nie znamy w takim przypadku nachylenia układu do naszej linii widzenia. ExtraTerrestrial Intelligence (SETI). Projekt ten rozpoczął się w latach siedemdziesiątych i do dzisiaj nasłuchuje oznak transmisji nadawanych przez obce cywilizacje. Alternatywne podejście oznacza stopniowe poszerzanie naszej wiedzy w procesie dół-góra, gdzie na każdym kroku możemy zdobywać coraz to nową wiedzę. Planety powstają w gazowo-pyłowych dyskach otaczających młode gwiazdy, lecz dokładne procesy fizyczne napędzające formowanie i ewolucję planet wciąż nie są w pełnie poznane. Wiemy, że te dyski istnieją przez kilka milionów lat, a embriony panetarne mogą migrować gdy są w nich wciąż zanurzone. Niektóre z nich oczywiście opadają na gwiazdę macierzystą, a innym udaje się przetrwać i urosnąć w tym procesie kończąc etap formowania w zupełnie innym miejscu, niż te w którym powstały. Jak owe planety rozkładają się wokół swoich gwiazd macierzystych i czy przypominają nasz własny układ planetarny, czy też może Układ Słoneczny jest na swój sposób unikalny? Obecność wody w stanie ciekłym na powierzchni planety nie gwarantuje istnienia na niej życia, lecz jest składnikiem niezbędnym do powstania życia takiego jakie znamy. Woda w stanie ciekłym może występować tylko w określonym zakresie odległości od gwiazdy macierzystej, w tzw. ‘ekostrefie‘. Jaki procent planet znajduje się w ekostrefach wokół gwiazd macierzystych, czy ich orbity są zazwyczaj stabilne czy niestabilne, i jaka jest ich charakterystyka fizyczna? Odnalezienie tych planet i zbadanie ich rozkładu to nasz pierwszy cel, zarówno obserwacyjny jak i teoretyczny. Musimy zgłębić ich różnorodność i zrozumieć procesy, które odpowiadają za ich formowanie i ewolucję. Poszukiwania planet pozasłonecznych przyniosły już całe mnóstwo odkryć, wśród których znaleźliśmy niesamowicie różnorodne planety. Już na tym etapie niezbędne stało się zaktualizowanie naszych modeli formowania planet pierwotnie stworzonych do wytłumaczenia ewolucji Układu Słonecznego. Wśród nich sa planety krążące wokół pulsarów, “Gorące jowisze“—gazowe olbrzymy okrążające swoje gwiazdy w ciągu kilku dni, planety, które zostały wyrzucone ze swoich układów i swobodnie przemierzają pustkę przestrzeni międzygwiezdnej i pierwszych kilka planet o rozmiarach Ziemi, krążących wystarczająco daleko od swoich gwiazd, aby na ich powierzchni mogła istnieć woda w stanie ciekłym. Astronomowie wykorzystują wiele metod do poszukiwania tych planet, a każda z tych metod jest szczególnie czuła na inny typ rozkładu planet w układzie planetarnym. (red circles), direct imaging (blue squares), pulsar timing (yellow stars) and microlensing (green pentagons) are shown. The planets of the solar system (yellow circles) are also depicted for comparison. The region of sensitivity of each method is also indicated. Badając charakterystykę rozkładu planet, a następnie testując przewidywania teoretyczne na danych obserwacyjnych, rozwijamy naszą wiedzę o tym jak planety powstają i jak ewoluują ich orbity. Istnieje jednak jeden typ planet, o których wciąż wiemy bardzo mało; zimne planety skaliste, znajdujące się wystarczająco daleko od swoich gwiazd, aby woda na ich powierzchni zamarzała. Teoria przewiduje, że na wczesnych etapach formowania planet, protoplanetarne embriony w tych regionach mogą tworzyć jądra składające się z lodu i skał, a następnie – pod warunkiem wystąpienia odpowiednich warunków – stopniowo akreować materię z otaczającego je dysku gazowego, powoli transformując je w gazowe olbrzymy. Niemniej jednak, jeżeli w otoczeniu jest mało gazu lub szybko się wyczerpuje, takie planety zbyt duże nie urosną. Tego typu obiekty są praktycznie niewykrywalne za pomocą metod tranzytu lub prędkości radialnych, ale są dokładnie tym typem planet, który pasuje do poszukiwań opartych o zjawisko mikrosoczewkowania. Einstein przewidział, że każda masywna gwiazda będzie zachowywała się jak soczewka grawitacyjna i będzie zakrzywiała promienie światła wyemitowane przez gwiazdę tła przechodzącą dokładnie za nią, a tym samym zaburzając jej kształt. Efekt soczewkowania w odległościach kosmologicznych jest obserwowany jako wiele rozmytych obrazów gwiazd tła otaczających krawędź wpływu grawitacyjnego gwiazdy soczewkującej. W przypadku mikrosoczewkowania odległości kątowe między obrazami tworzonymi wskutek soczewkowania są rzędu mikro-sekund łuku, i owe obrazy nie mogą być rozdzielone na pojedyncze przy wykorzystaniu obecnych technologii. To co w rzeczywistości obserwujemy podczas zjawiska mikrosoczewkowania to zwiększenie jasności gwiazdy tła gdy na niebie zbliża się do niej soczewka i zmniejszanie jasności do normalnego poziomu, gdy soczewka się od niej oddala. Stosunek ruchów własnych między gwiazdami w Galaktyce umożliwia powstawanie zjawisk mikrosoczewkowania trwających przez kilka tygodni, a nawet kilka miesięcy. Jeżeli soczewką jest układ planetarny, istnieje szansa, że planety mogą zaburzyć światło pochodzące z gwiazdy tła i spowodować powstanie krótkich lecz intensywnych anomalii na krzywej jasności, które mogą ujawnić istnienie planety wokół gwiazdy soczewkującej. Tego typu anomalie zazwyczaj trwają kilka dni w przypadku planet o masie Jowisza i zaledwie kilka godzin w przypadku planet o masie Ziemi. Z uwagi na fakt, że obecność obiektu soczewkującego można wywnioskować tylko przez wpływ grawitacyjny, a nie emitowane przez niego promieniowanie, metoda ta może pozwolić na wykrywanie planet krążących wokół bardzo słabo świecących gwiazd, a nawet wokół brązowych karłów czy czarnych dziur. 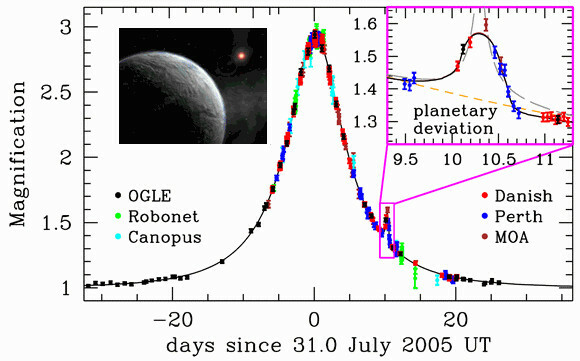 Lightcurve of microlensing event OGLE-2005-BLG-390 showing a 12-hour planetary anomaly attributed to a ~5.5 Earth-mass planet. Mikrosoczewkowanie to rzadkie zjawisko. W naszej własnej Galaktyce tylko około miliona gwiazd może być soczewkowanych w danym momencie. Mimo to, współczesne przeglądy nieba pod kątem mikrosoczewkowania (OGLE, MOA), monitorujące ekstremalnie zatłoczone pole Centralnego Zgrubienia Galaktycznego ogłaszają ~2,000 tego typu zjawisk w ciągu roku. Niewielka część tego typu zjawisk wybierana jest do dalszego monitoringu przez inne zespoły (RoboNet, μFun, MiNDSTeP, PLANET), nastepnie rozpoczynają się intensywne obserwacje mające na celu poszukiwanie odchyleń planetarnych. Pierwsze wyniki poszukiwań zjawisk mikrosoczewkowania w zakresie promieni orbity od 1 do 10 AU wskazują, że lodowe i gazowe olbrzymy są stosunkowo powszechne wokół karłów typu widmowego M. Owe poszukiwania pozwoliły na odkrycie wielu masywnych planet i brązowych karłów krążących wokół gwiazd o małej masie, kilku planet o masie zbliżonej do Ziemi, układów z wieloma planetami, a prawdopodobnie także pierwszego egzoksiężyca. W ciągu najbliższych kilku lat naziemne poszukiwania zostaną wsparte przez misje kosmiczne, które pozwolą na dużo wyraźniejsze poznanie rozkładu planet w lodowych regionach układów planetarnych i dalej. O autorze. Aktualnie zatrudniony na stanowisku badawczym w Zentrum für Astronomie w Heidelbergu. Wcześniej Yiannis sycił swoją ciekawość naukową pracując dla instytutu LCOGT (2007-2014). W latach 2012-2014 był także wykładowcą w School of Physics and Astronomy, Queen Mary University. Wcześniej piastował stanowisko badawcze w ARI w Liverpoolu. Otrzymał tytuł doktora astronomii na University of St Andrews w 2003 roku oraz MSc w radioastronomii na University of Manchester w 1999 roku. Jego główne zainteresowania naukowe skupiają się na badaniu i poszukiwaniu egzoplanet za pomocą mikrosoczewkowania oraz tranzytów. Jest także członkiem-założycielem projektu RoboNet, w ramach którego wykorzystuje sieć teleskopów LCOGT do wykrywania egzoplanet za pomocą mikrosoczewkowania. Oprócz egzoplanet, interesuje się astronomi robotyczną, przeglądami ciemnej materii, kosmologią CMB i programami popularyzującymi naukę. What incredible times we are living in — searching for an Earth around another star! Not much more than 20 years ago, I looked at the few astronomers hunting for planets, and I shook my head and thought “they are crazy”. Similar to many other occasions throughout my life, I was to be proven wrong. Nature, of course, helped those early planet hunters quite a lot, by making Hot Jupiters. These are systems inducing radial velocity variations 10 times larger, and with much shorter periods, than the giant planets of the Solar System, which were the only ones known at that time. I believe that the influence of the discovery of the first confirmed exoplanet 51 Pegasi b by Mayor and Queloz, will be very long lasting indeed. By proving the existence of what was before then only considered likely to some of us, or an obvious hypothesis for others, their work unleashed a wealth of energy to the subject that had been unthinkable before. We are now able to analyse exoplanet atmospheres, and to search for small mass exoplanets in the habitable zones of other stars, planets that can harbour life in the way we know it. Such a tremendous explosion of results has only been possible because fundamental technological advancements have taken place in the past 20 years, advancements that now allow us to search for solar systems and Earth analogues. Previous expert opinions have shown us that, in order to detect the planetary radial velocity signals, a lot of effort is needed to filter the stellar ‘noise’ (activity, oscillation, variability), and in order to best do that, one needs very precise spectroscopy and long observing campaigns. This requires proper instrumentation and dedicated telescopes. Several observatories such as the European Southern Observatory (ESO) are well equipped with both. A HARPS Laser Frequency Comb generated spectrum. 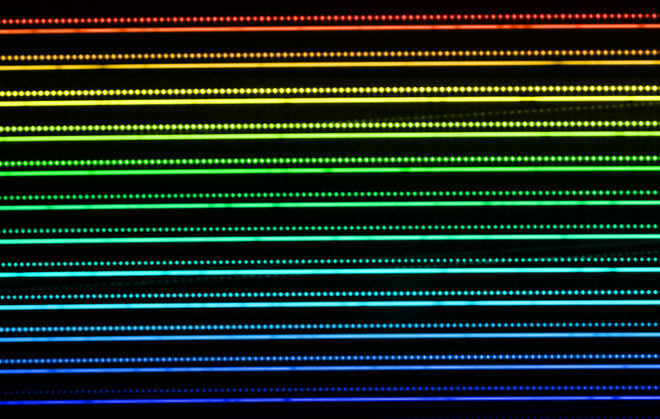 The horizontal lines are spectral orders (each has two separated fibres, one fed by starlight, the other by A frequency comb combs). The colour reflects the covered spectral range, from short wavelengths (blue) to long ones (red). Each horizontal line corresponds to a diffraction order and is generated and it is composed of thousands of separated, single emission peaks, whose frequency is known with very high accuracy, and are stable over long times. LFC are the next generation of ‘rulers’ to measure precise radial velocities. Precision is the key word. The radial velocity signal induced by an Earth orbiting around a solar mass star with a period of 1 year, is less than 10 cm s-1. Just to provide some comparison, this implies that we must be able to measure the periodic shift of the stellar radial velocity in the focal plane of a typical high-resolution spectrograph for several orbital periods, over several years with a peak shift of just 2 nanometers (10-9 meters or 0.000000001 meters). In addition to requiring the utmost care in stabilising the instruments in temperature and pressure, reaching such a precision requires a very precise ruler, and for this reason several groups in the world have been engaged for almost a decade in work developing the perfect ruler. Currently the most precise rulers are based on Laser Frequency Combs (LFCs), a technique that led to the Nobel Prize for physics being awarded to T. Hänsch and J. Hall in 2005. 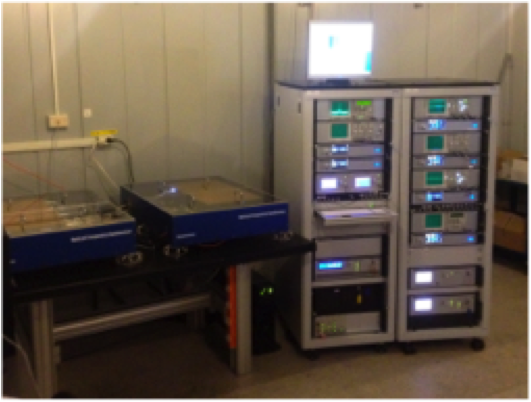 The LFC can create a series of precisely equally spaced and stable emission lines for spectrograph calibration, whose frequency is known with high accuracy. The worldwide leader instrument in radial velocity precision is probably HARPS at ESO’s La Silla Observatory in Chile. Up to now it has been using the emission line Thorium-Argon lamps as a ruler, but it has been recently equipped with a prototype Laser Frequency Comb system. The short-term tests of this system indicate that a precision of better than 2 cm s-1 can be reached. Advances in understanding optical fibres and their technology, and getting bigger and better optical detectors have also been vital in obtaining the best performance. 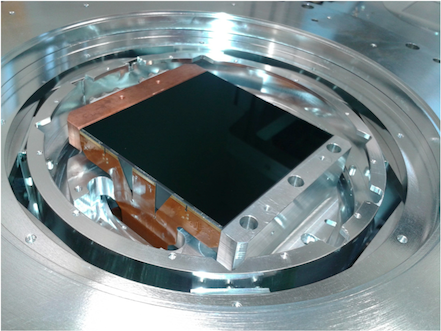 Optical CCDs are now very clean devices that can be accurately calibrated. The Laser Frequency Comb hardware in the HARPS room at the ESO 3.6m telescope at La Silla, it is ‘a bit’ more complex system than a lamp. 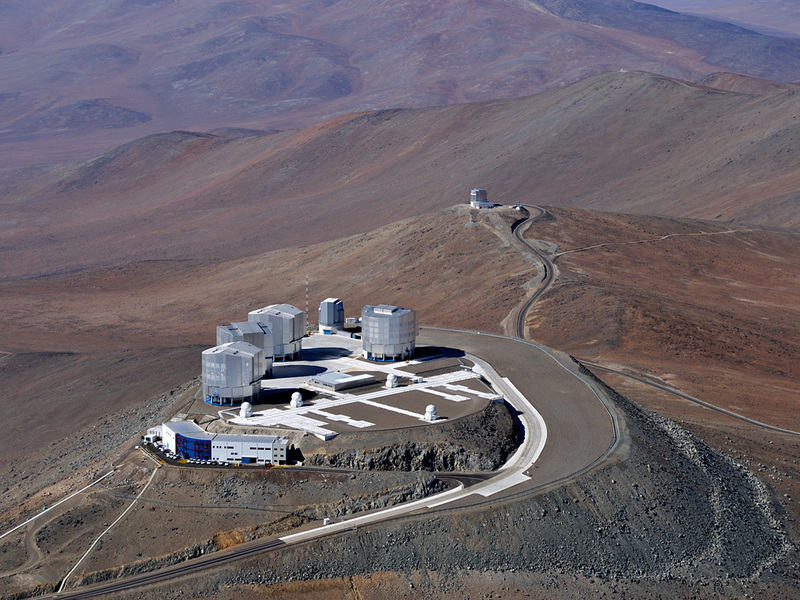 Great expectations are placed on ESPRESSO, the ‘big brother’ instrument to HARPS, that will be hosted at the ESO Very Large Telescope at Paranal before the end of the year. This instrument will boost the original HARPS precision by one order of magnitude and, in addition, will be used by any of the VLT telescopes, or by the four 8-metre Unit Telescopes together, with a 16 metre telescope equivalent diameter. Often the stars observed are relatively bright, so one could question why large telescopes are needed, but we must realise that high precision requires also a lot of stellar photons, or particles of light, hence the quest for large telescopes. A further step in precision is expected from the high-resolution spectrograph at the 39-meter E-ELT. The CODEX concept was originally conceived to measure Doppler shifts so precise such that we would be able to directly observe the expansion of the Universe and Earth-like planets around solar type stars in their habitable zones. The 25-metre Giant Magellan Telescope is planned to have a similar instrument for its first light. The ESPRESSO CCD. With 81 million pixels, this device is the largest monolithic detector ever used in astronomy. Each side is 9 cm long. Planets are cool compared to stars, and emit most of their light as infrared (IR) radiation, which is invisible to the human eye. Expanding observations to this spectral range is therefore essential, and the development of large IR detectors played a fundamental role: progressing in a few years from arrays of a few thousand pixels, to the most recent 16 million pixel devices, which enabled the construction of efficient high resolution infrared (IR) spectrographs. These spectrographs, such as CRIRES at the VLT, have been used to hunt for planets and to observe exoplanet atmospheres. In addition, the radial velocity signal produced by the rotation of inhomogeneities on the stellar surface can mimic the RV periodic variations induced by a planet, but , while the variations induced by the planet are the same for any measured wavelength of light, they are different in the optical and in the IR for the stellar spots that rotate around the star’s surface. 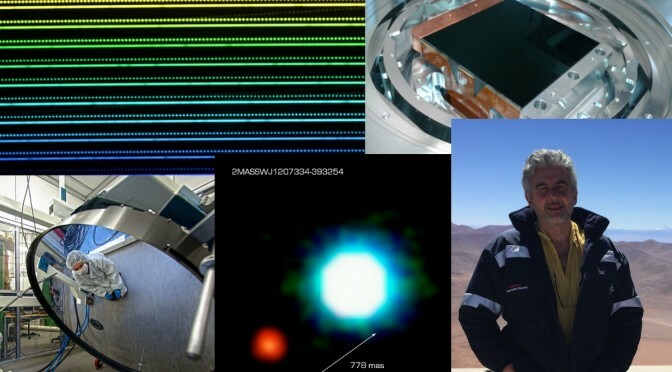 That is why the newest generation of spectrographs have a great interest in the IR, and NIRPS, which will be hosted at the ESO 3.6-metre telescope at La Silla, CARMENES at the Calar Alto Observatory, Spirou at CHFT, and the high resolution spectrograph for the E-ELT, will all have an IR arm. Even if this contribution focuses on radial velocities and spectroscopy, we should not underestimate the power of imaging. 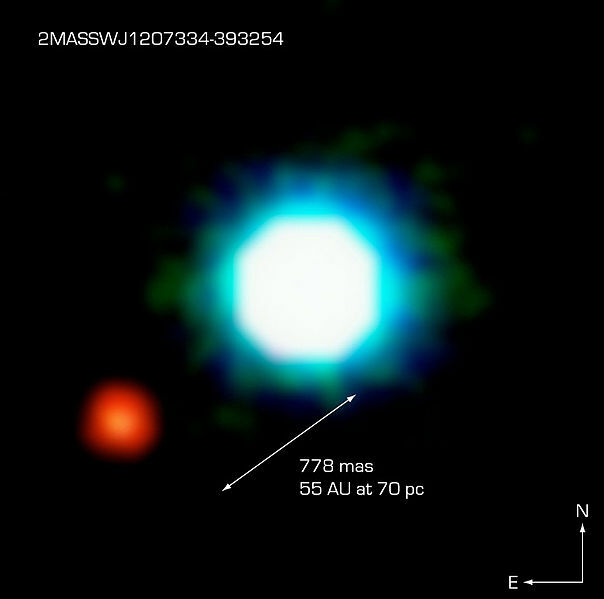 NACO at the VLT has imaged the first exoplanet around a very low mass star, similar to Proxima Centauri, and it is beyond any doubt that images, like the one shown below, have been transformational. More powerful high contrast imagers recently became available, imagers such as SPHERE at the VLT and GPI at GEMINI. These create superb images of planets and proto-planetary discs and are able to detect objects more than one million times fainter than the host star. And the next generation of instruments that will be able to exploit the tremendous potential of the ELTs is already taking shape. Large surveys are now carried out and images of exoplanets are becoming more and more common. The enabling technology has been adaptive optics, a technique that deforms mirrors to compensate for the atmospheric turbulence and therefore recovers the cleanest image of the telescope, as if it was in space, observing with no turbulent atmosphere to look through. Deformable mirrors with more than 1000 actuators, applying corrections faster than 1000 times per second are needed, and they have been developed either of small size, for instance for SPHERE and GPI, or of large size, and these are directly replacing the secondary mirrors of the telescopes, as has happened at the Large Binocular Telescope and soon will occur at the VLT. 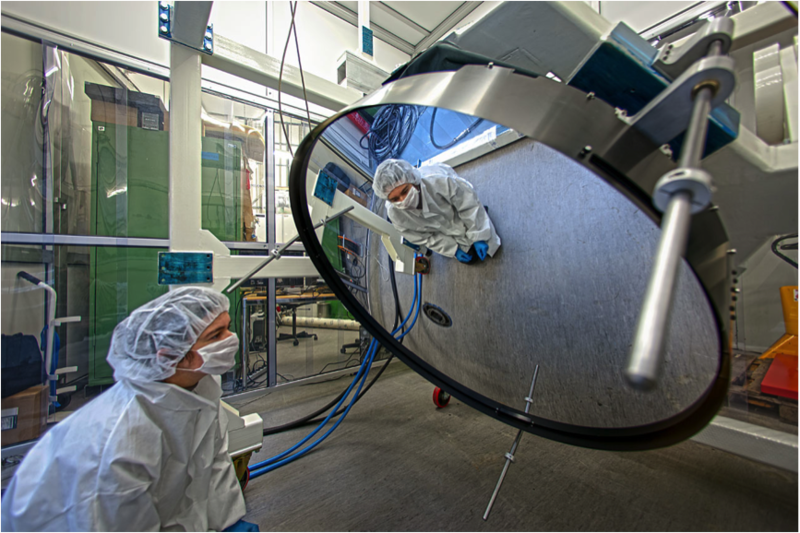 The Adaptive Secondary Mirror of the VLT is 1.12 m in diameter and extremely thin: the glass shell is only 2 mm thick. Being so thin, it can be easily deformed, and 1170 actuators act on the back of the glass to correct in real time the distortions induced by the Earth’s atmosphere in the observed images. In a nutshell, thanks to all these great instruments, exoplanet science has a bright present, and even more promising future. About the author. Luca Pasquini is an astronomer, working at ESO, Garching, and since 2013 he has been managing the Paranal Instrumentation Programme. 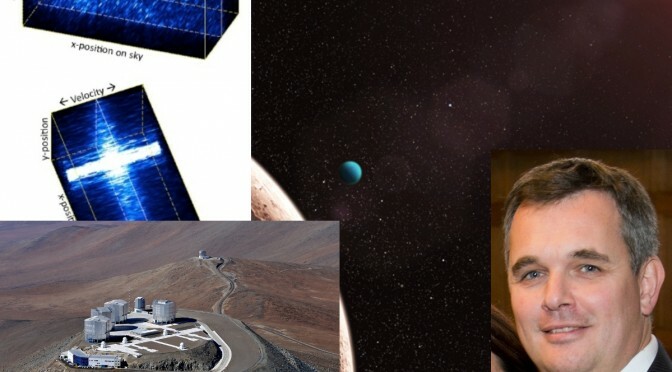 After completing his studies in Firenze (Italy), he moved to become an ESA postdoc at MPE (Germany) in 1986, and then went on to ESO La Silla (Chile), where he was in charge of high resolution spectroscopy and of the 3.6m telescope upgrade. In 1997 he moved to ESO Garching, to work in the instrumentation group there. Before his present position, he has been instrument scientist for the FEROS, HARPS, FLAMES, MUSE, and ESPRESSO spectrographs. 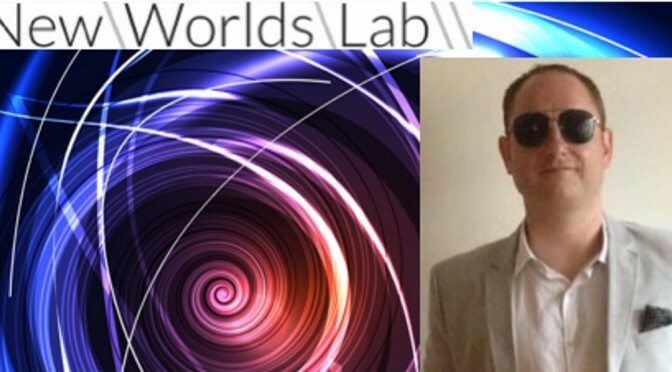 His scientific work and interests range from stellar activity and stellar abundances, to search for planets around giant stars and around stars in open clusters, as well as to different applications of precision spectroscopy. The opinions expressed in the blog posts published on this website belong to the authors only and they are responsible for the correctness of all the information included. The project editors are committed to sharing how observations take place while respecting the normal workflow for a scientific study. Proxima b, where did it come from? Proxima b is our neighbor… better get used to it! Jak gwiazda może ukryć swoje Ziemie?